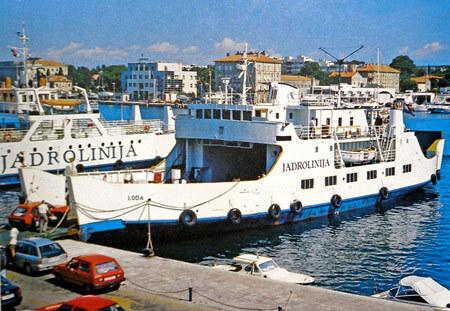 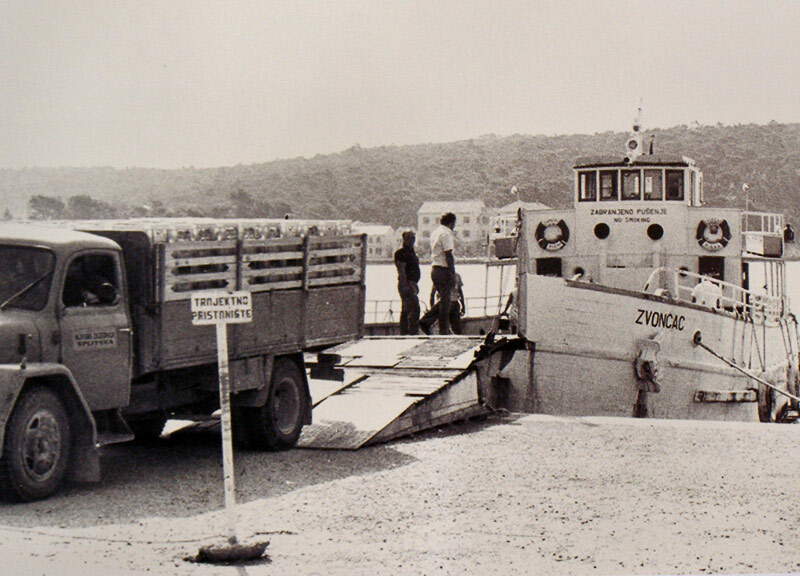 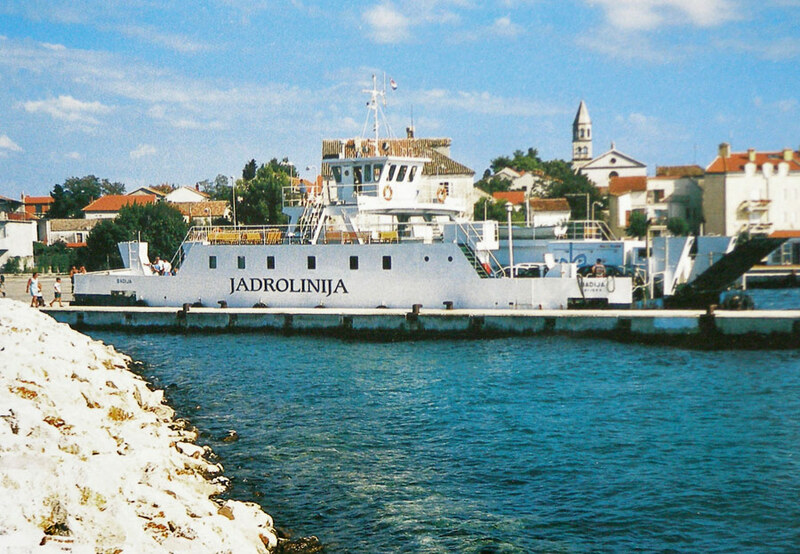 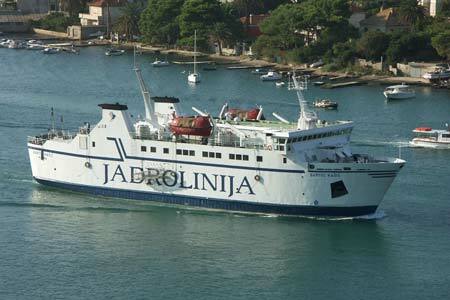 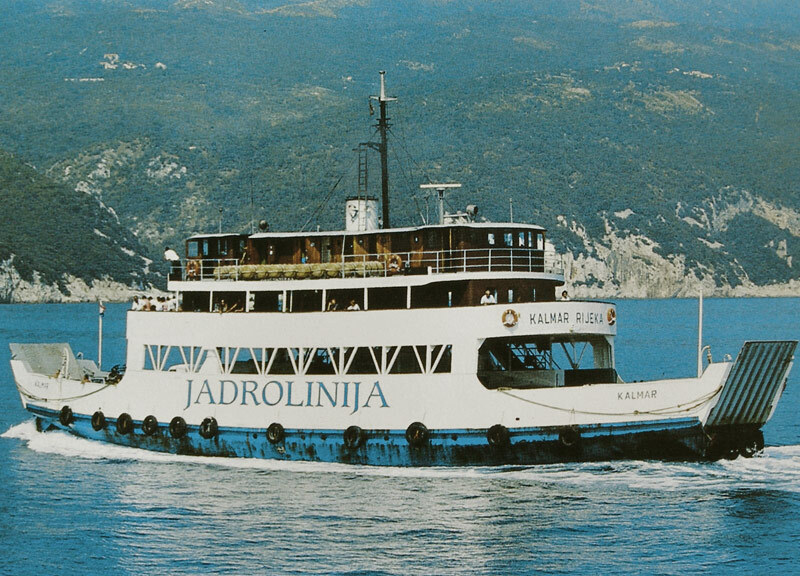 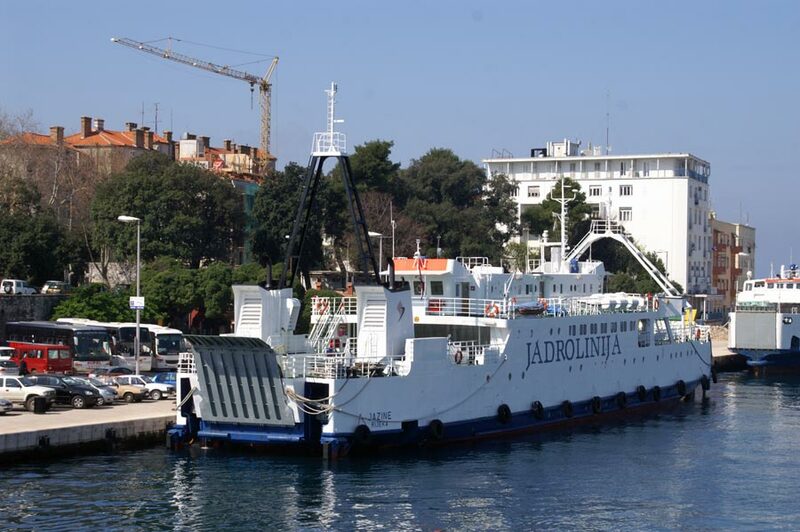 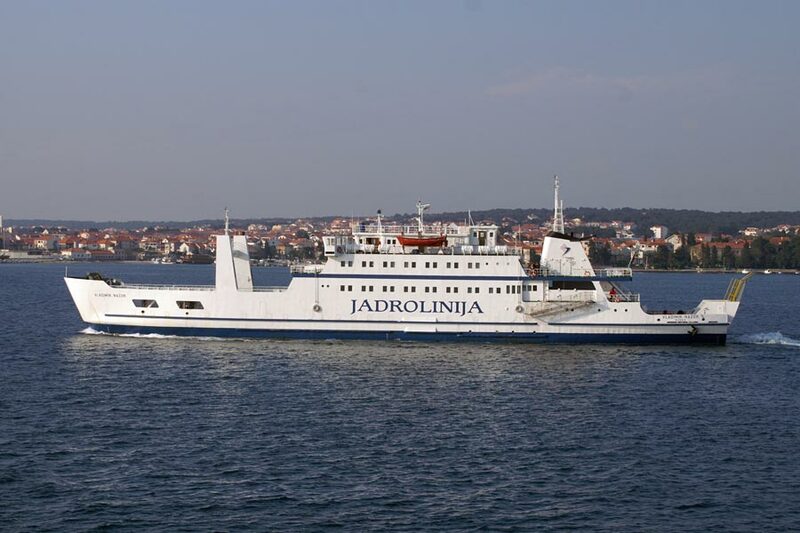 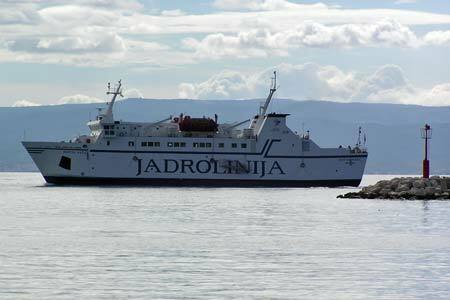 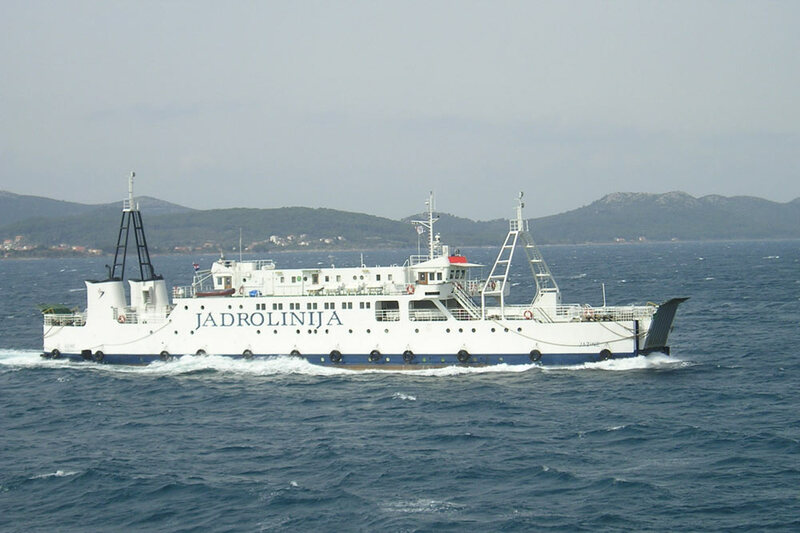 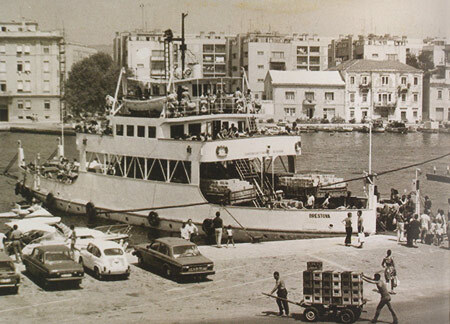 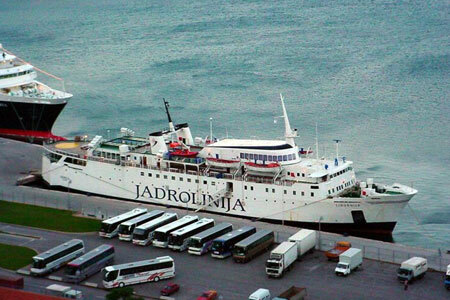 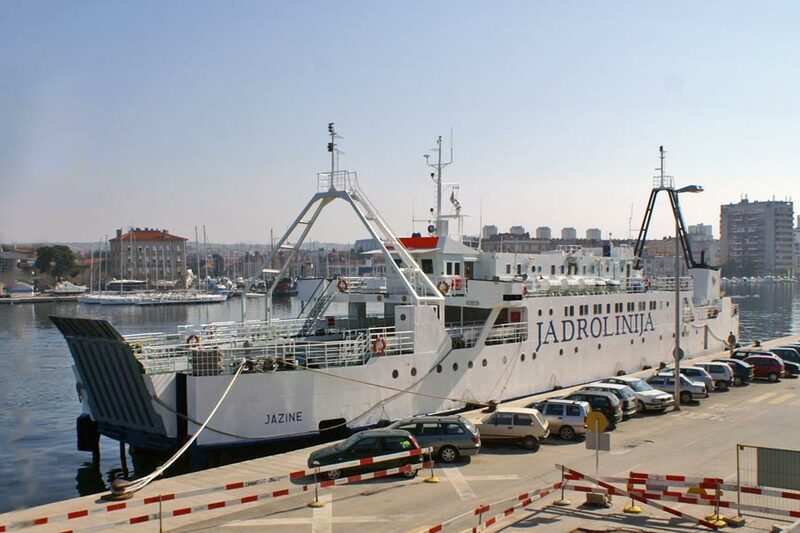 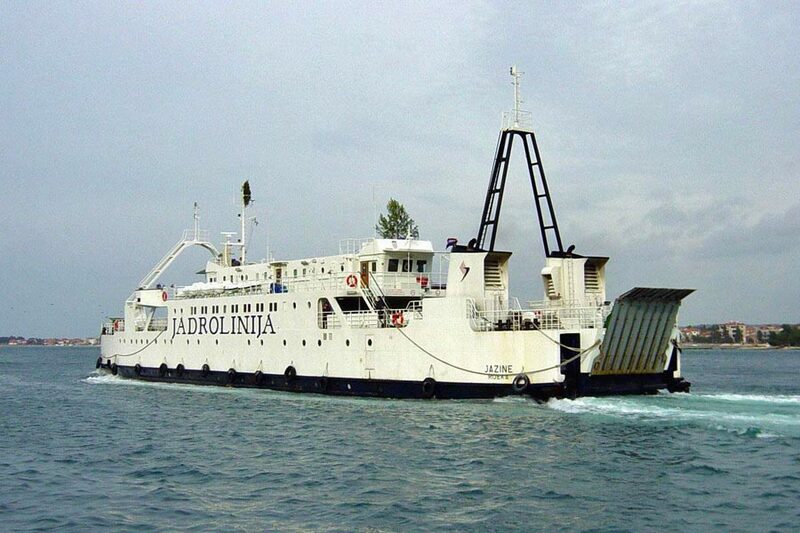 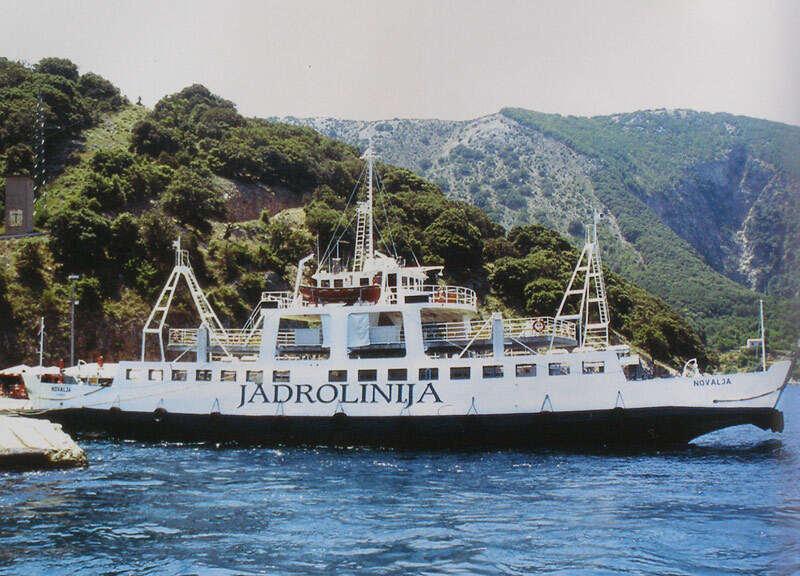 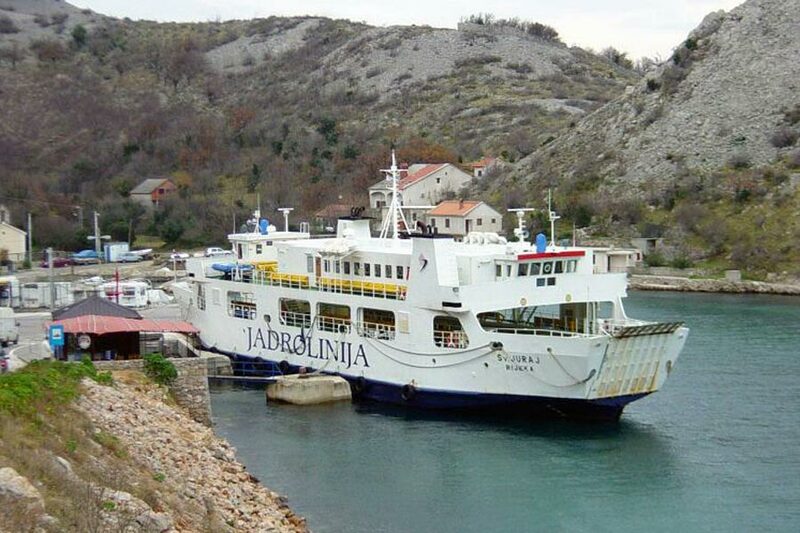 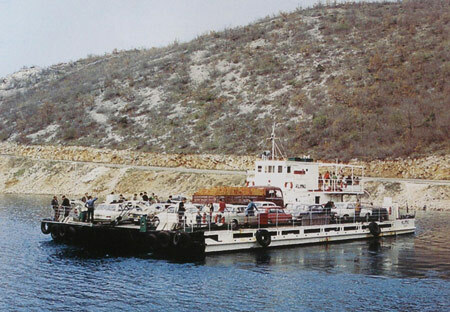 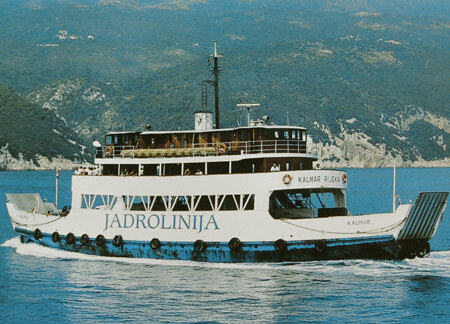 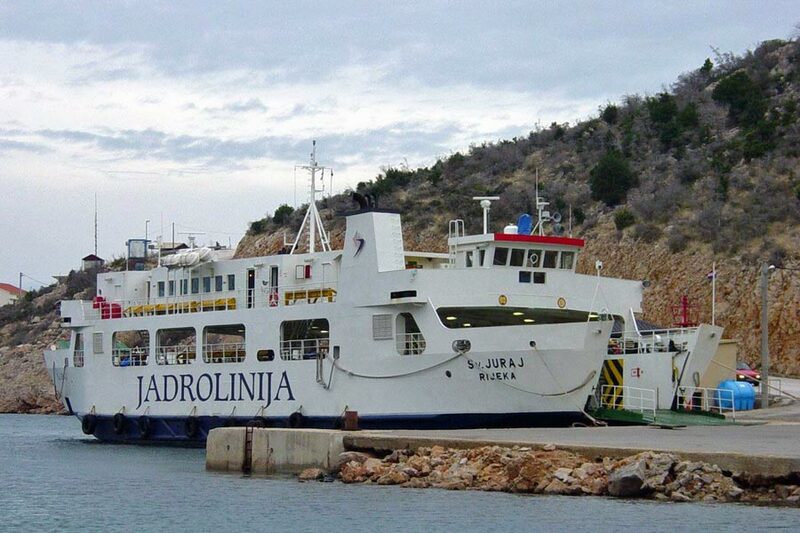 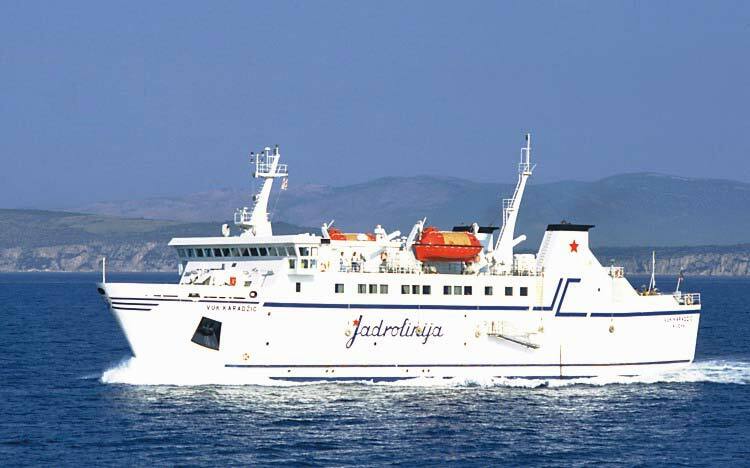 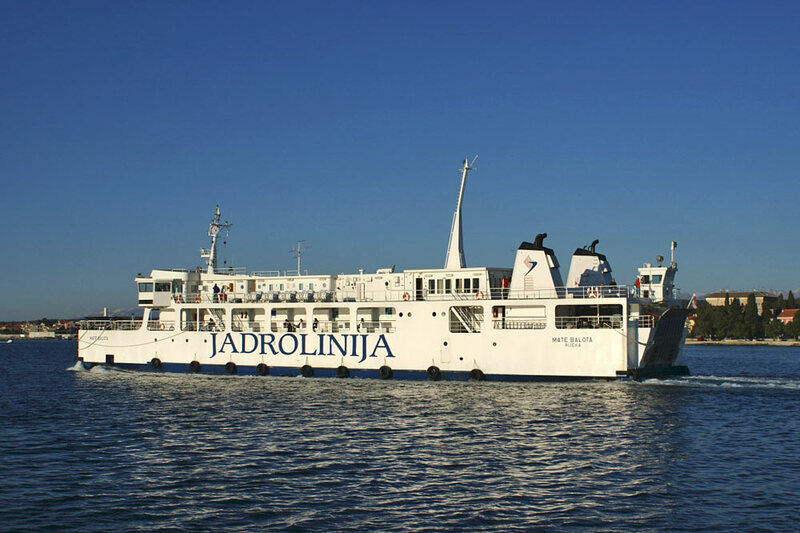 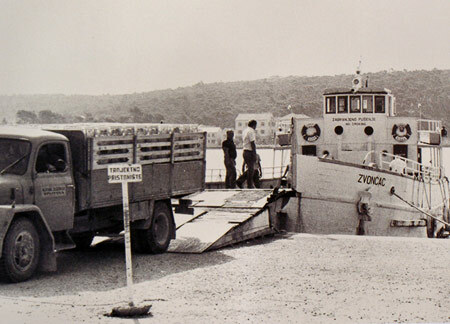 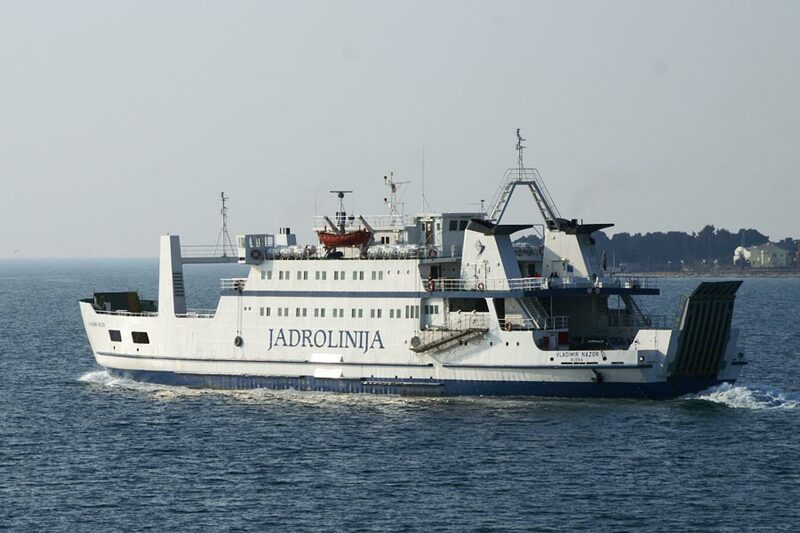 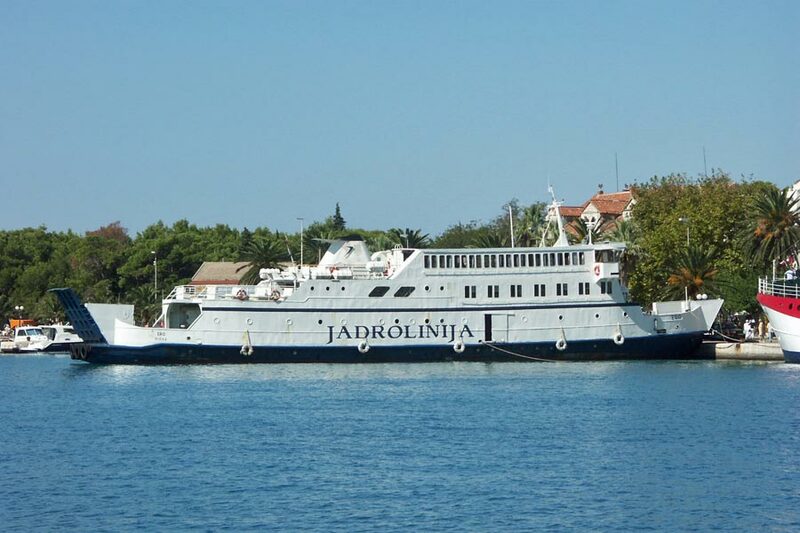 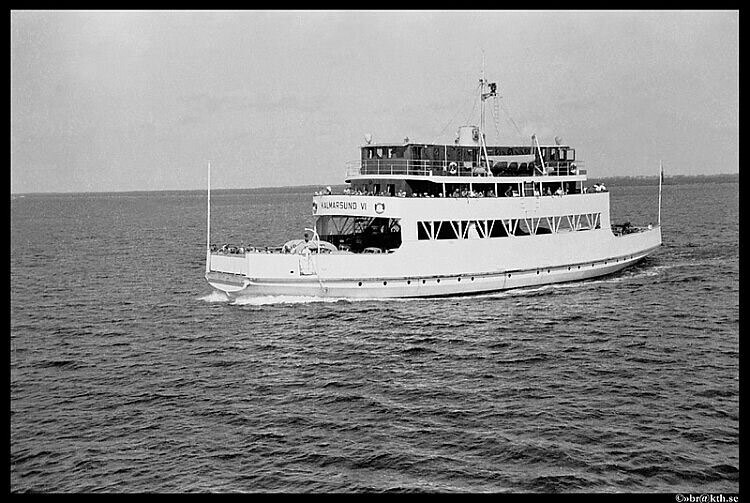 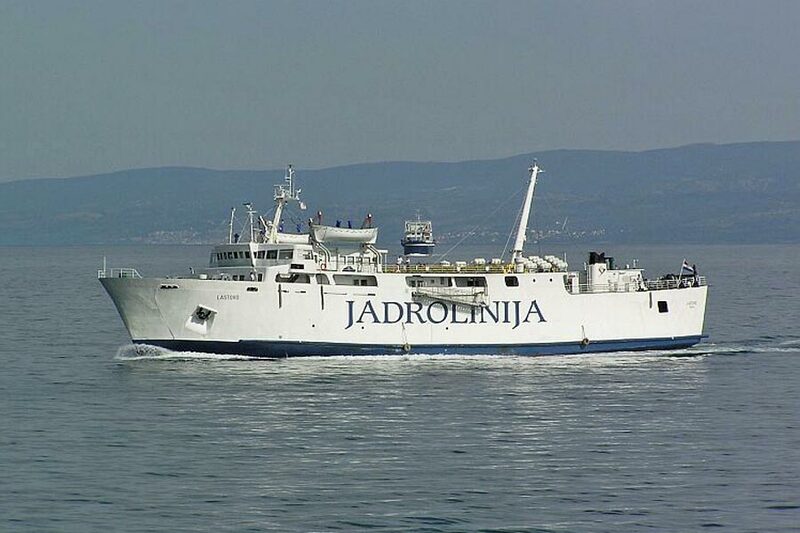 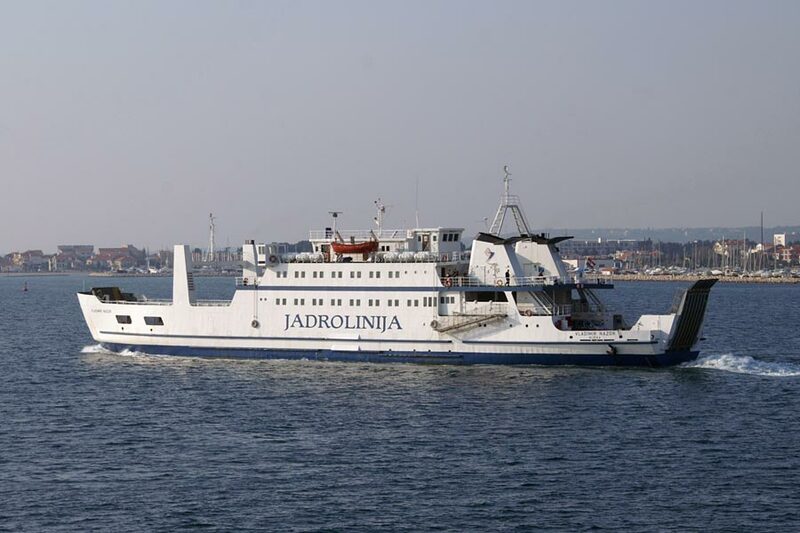 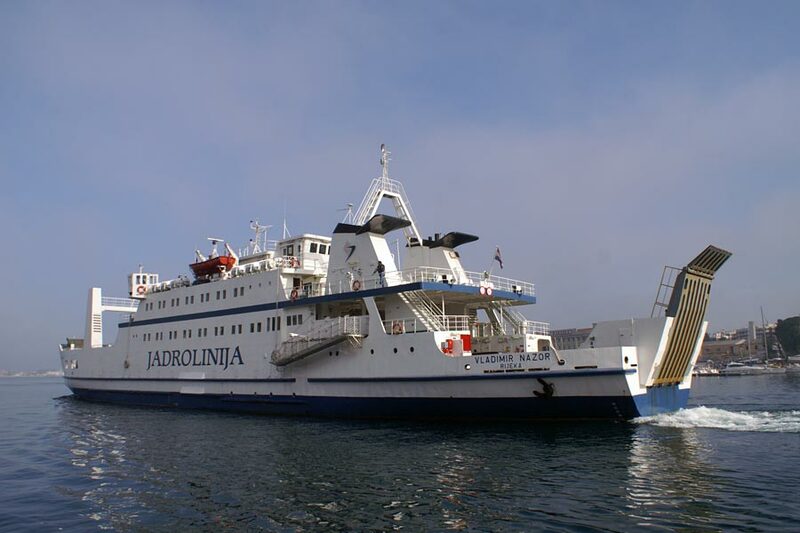 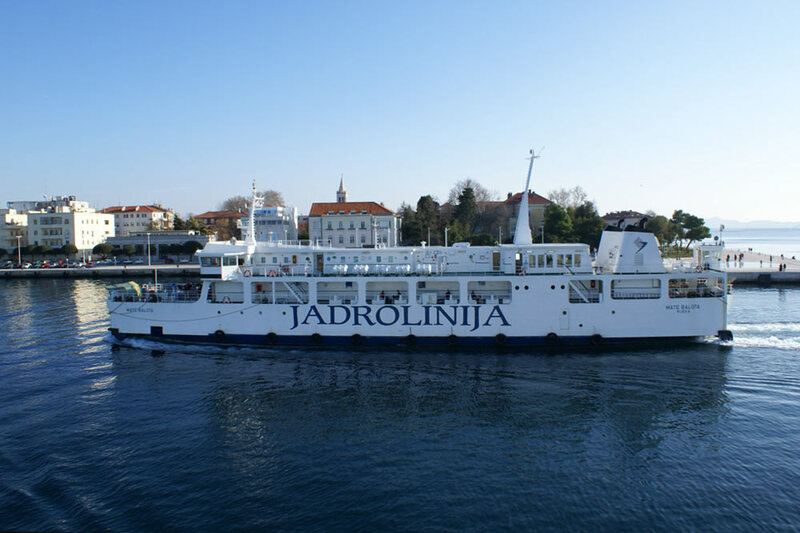 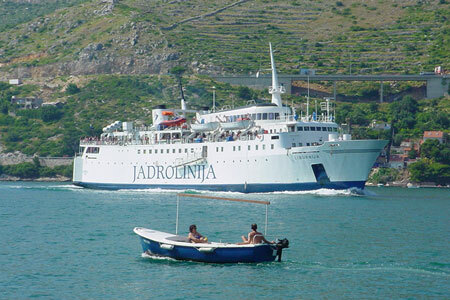 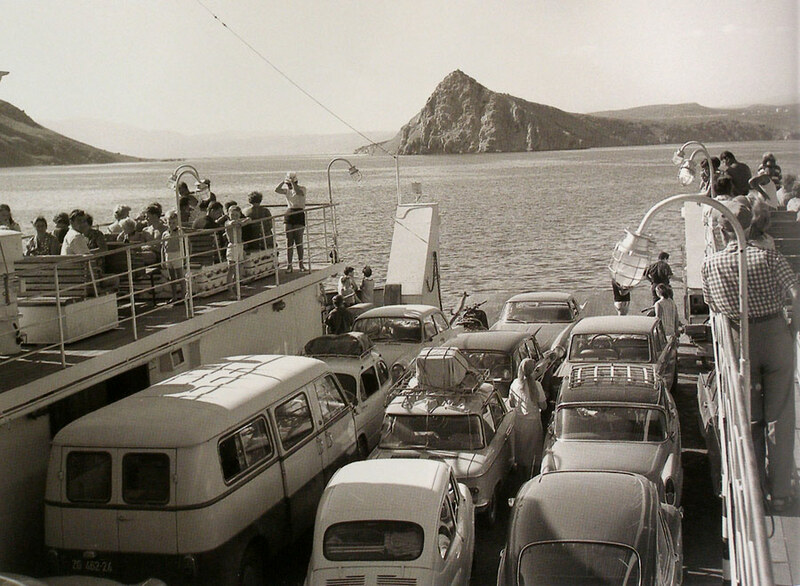 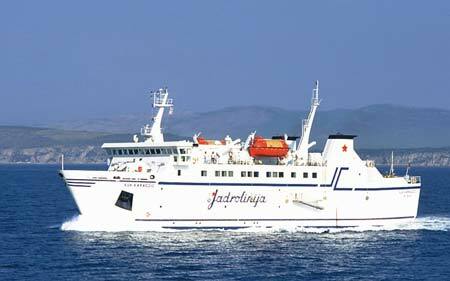 Jadrolinija Page 3 - Car Ferries 1947-1990 This Page! 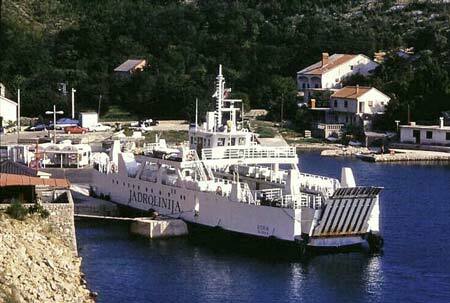 Losinj was built in 1955 by Uljanik, Pula for the Croatian Navy (unknowm name/serial number). 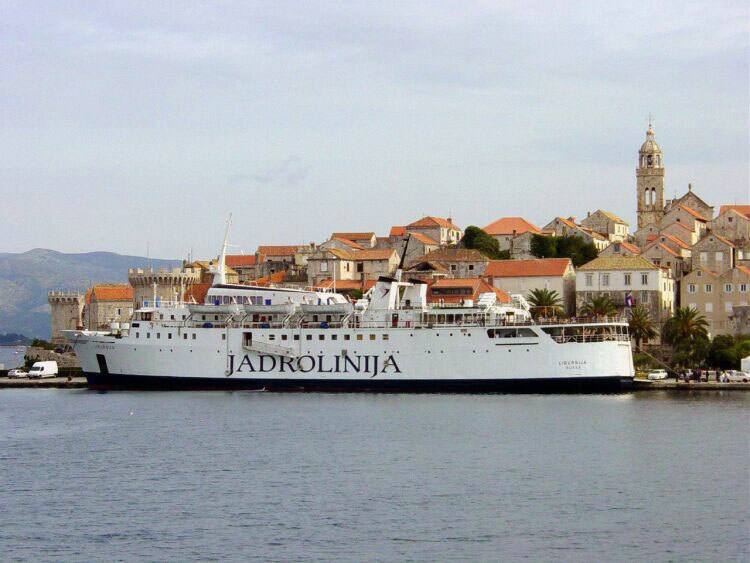 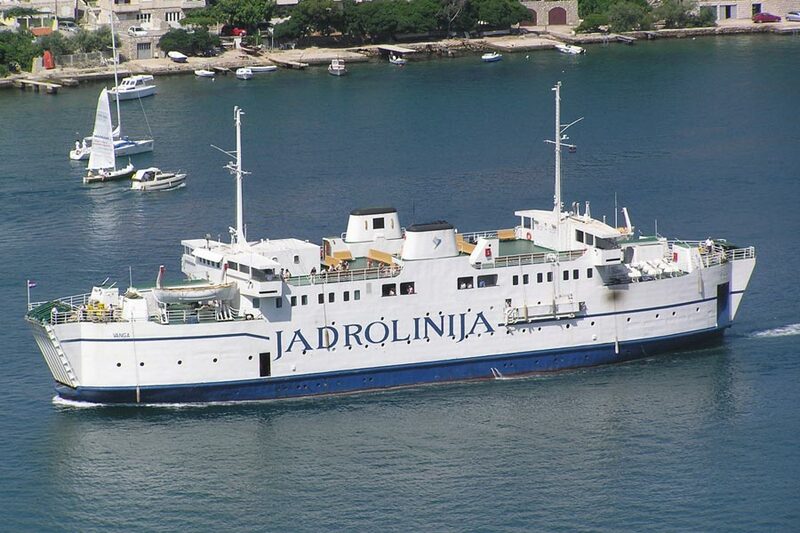 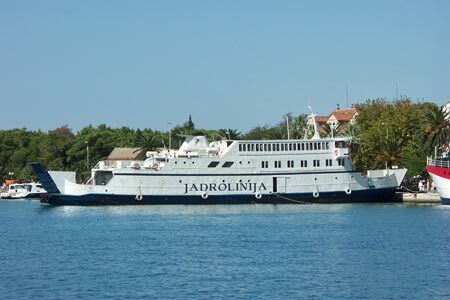 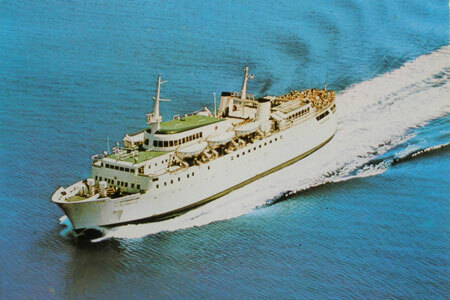 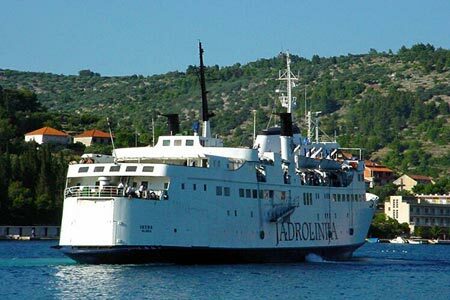 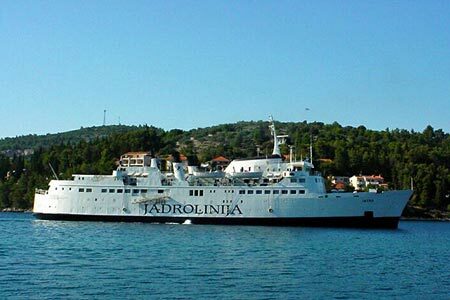 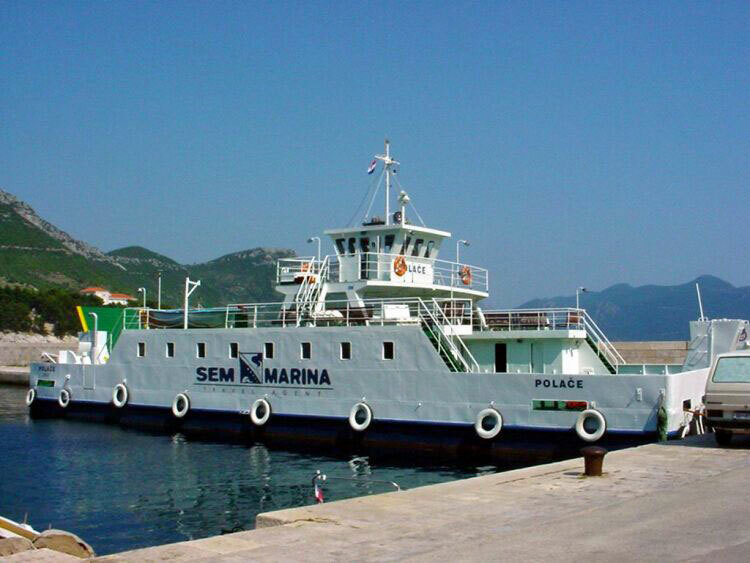 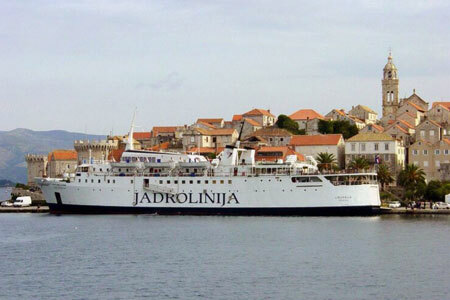 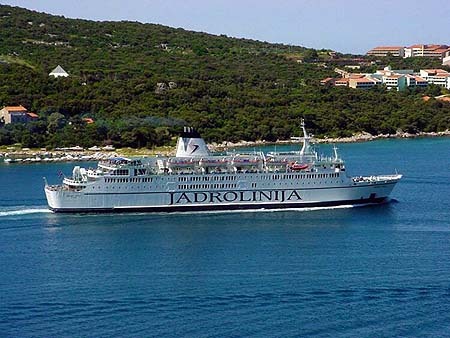 In 1965 she was bought by Jadrolinija and renamed Losinj, and in 1971 was renamed Sumartin. 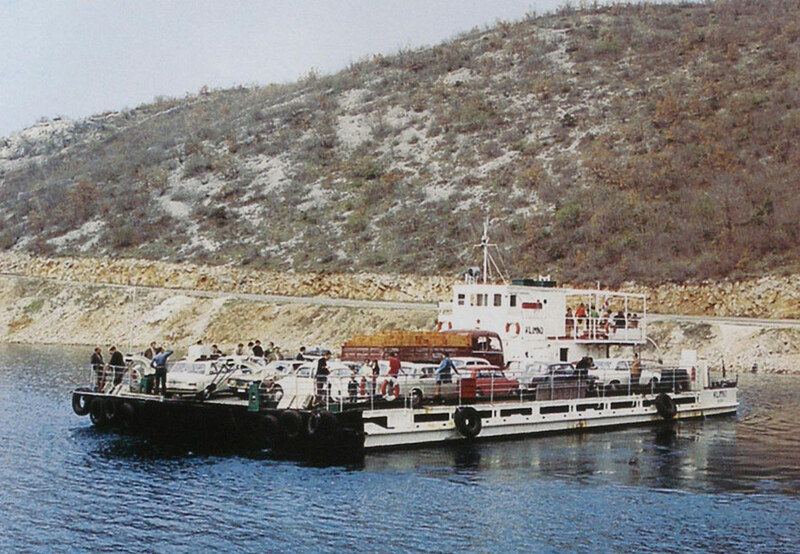 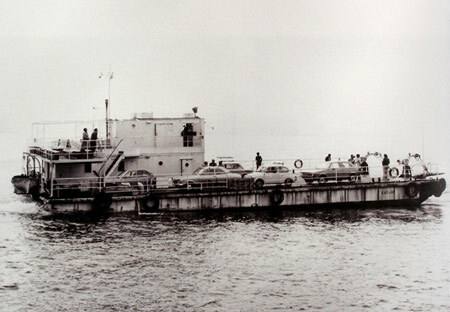 Sumartin was lengthened in 1981 to 33.2m, with car capacity increased to 30. 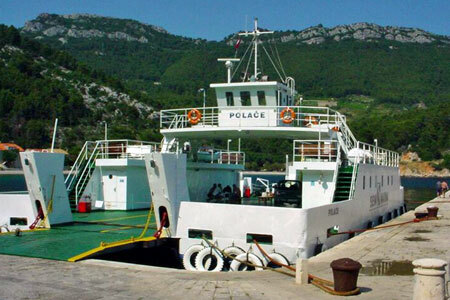 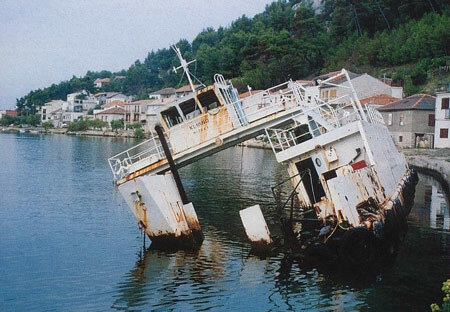 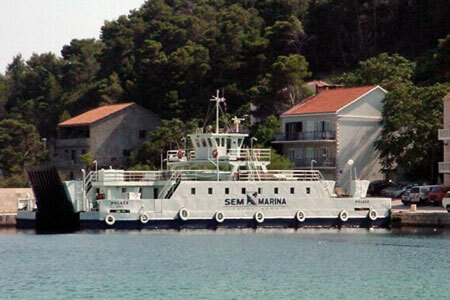 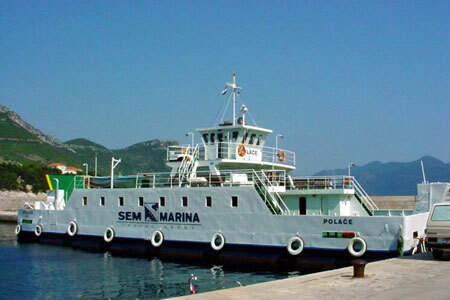 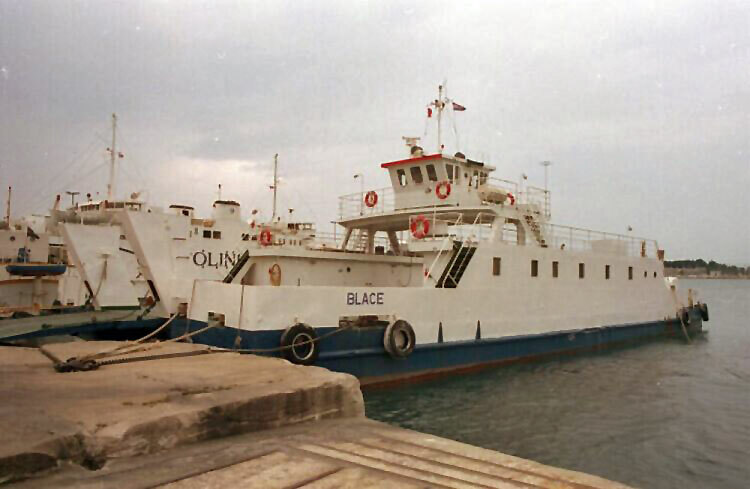 In 2001 Sumartin was sold to Opcina Mljet (managed by SEM Marina), Split, and renamed Polace for service between Trstenik-Polace. 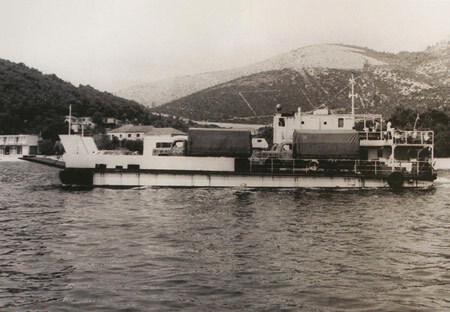 Ownership passed to Tanker d.o.o. 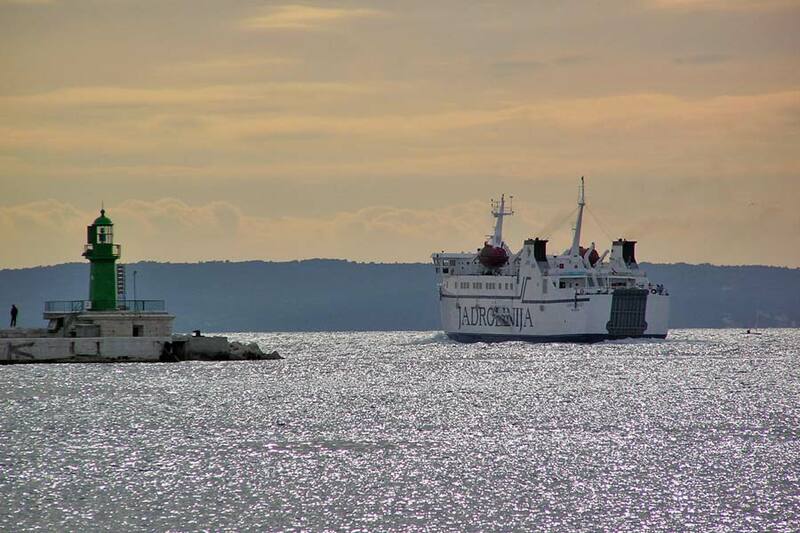 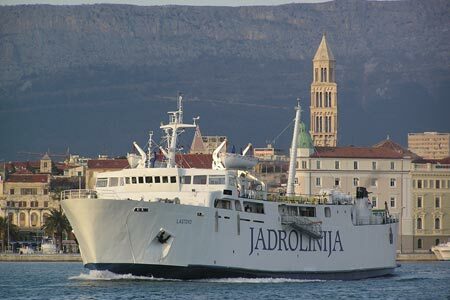 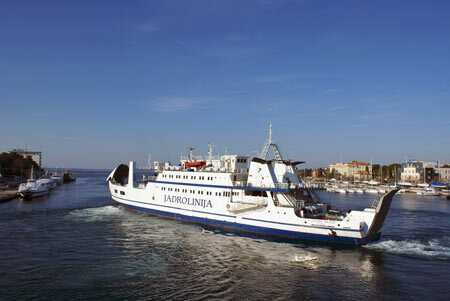 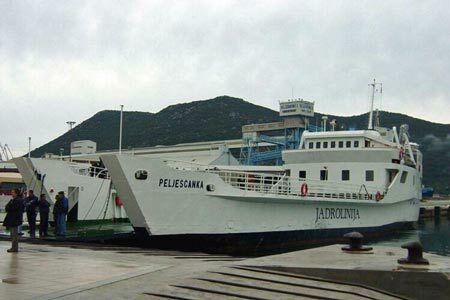 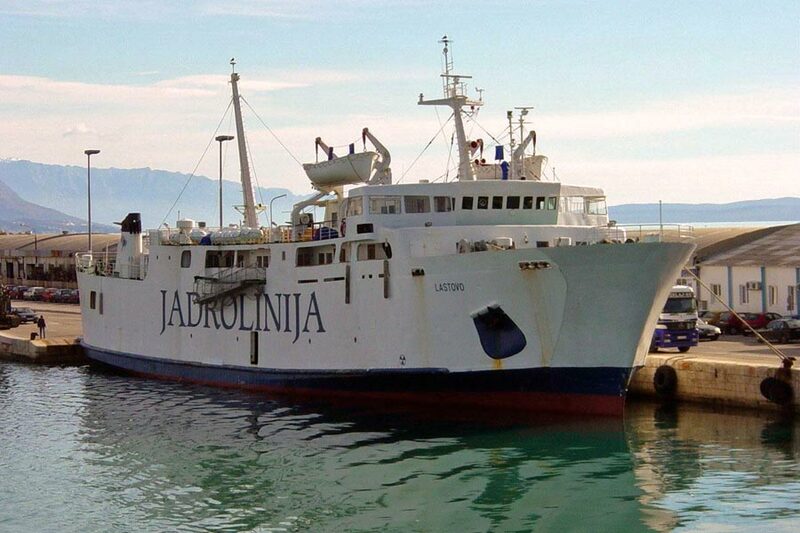 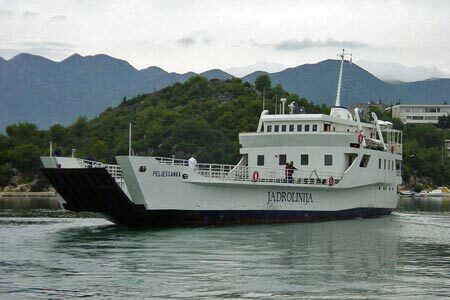 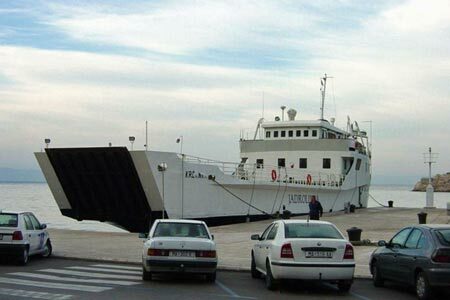 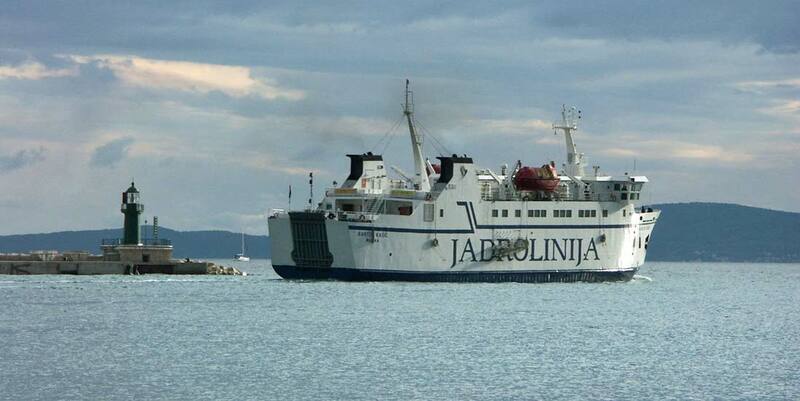 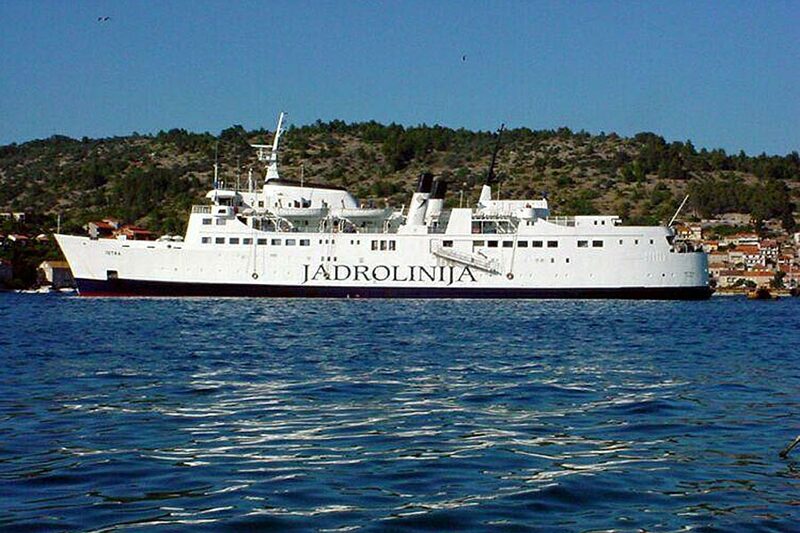 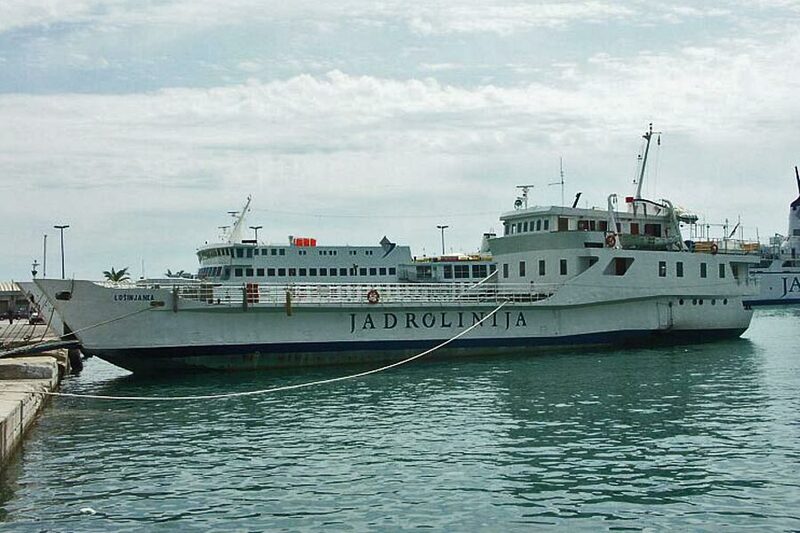 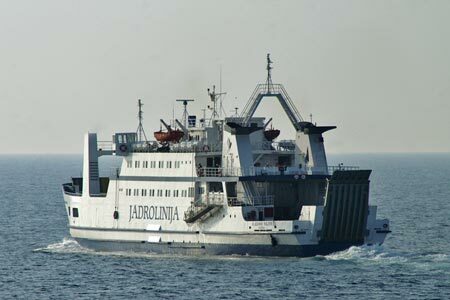 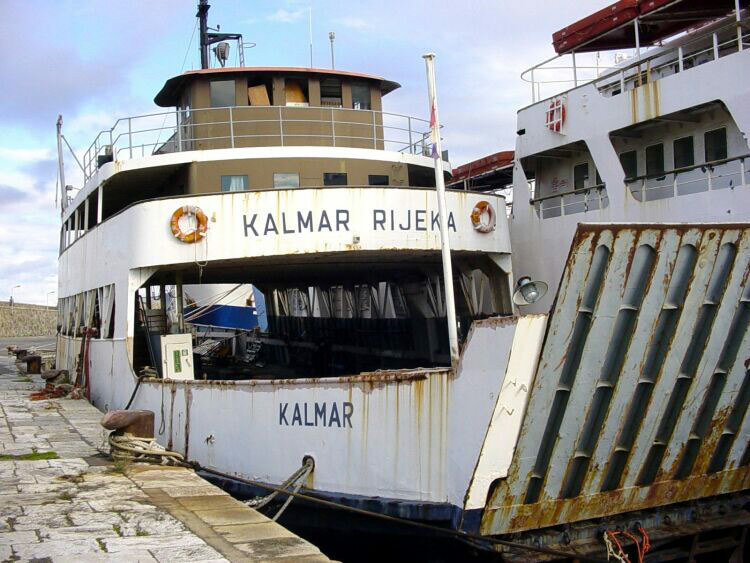 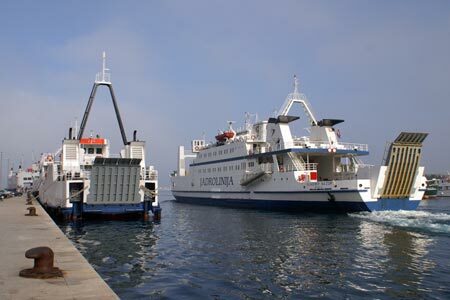 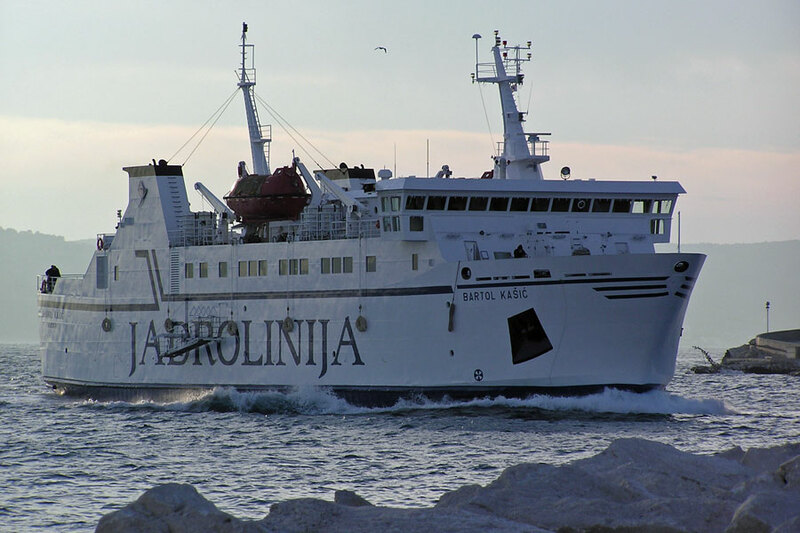 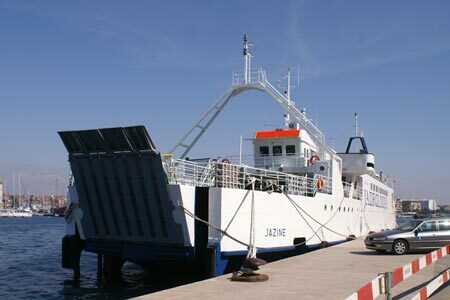 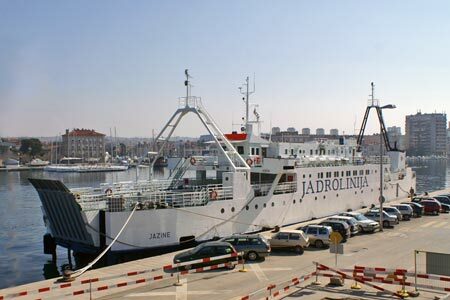 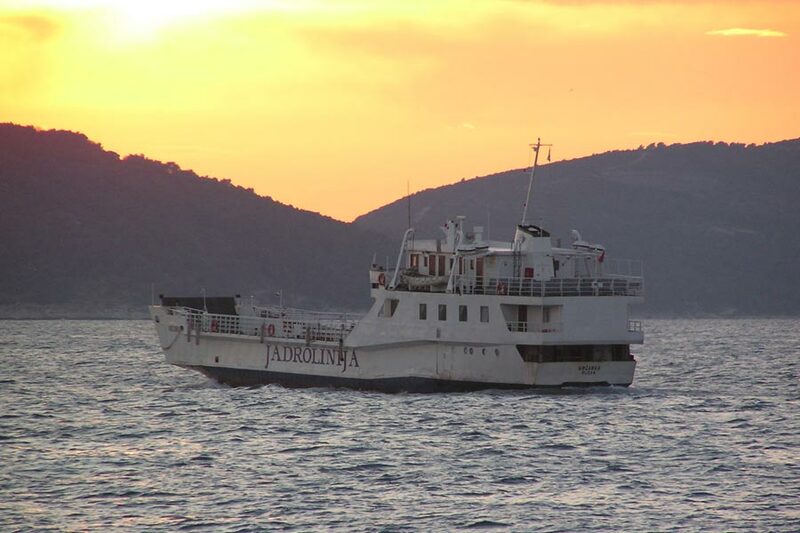 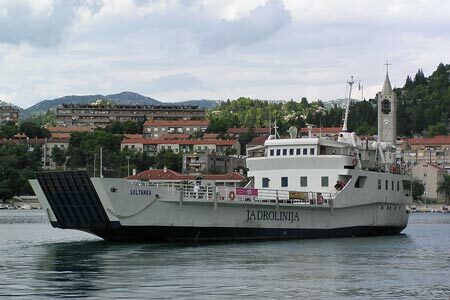 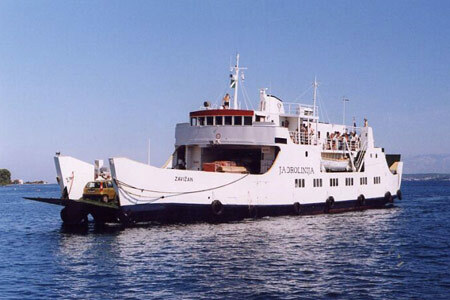 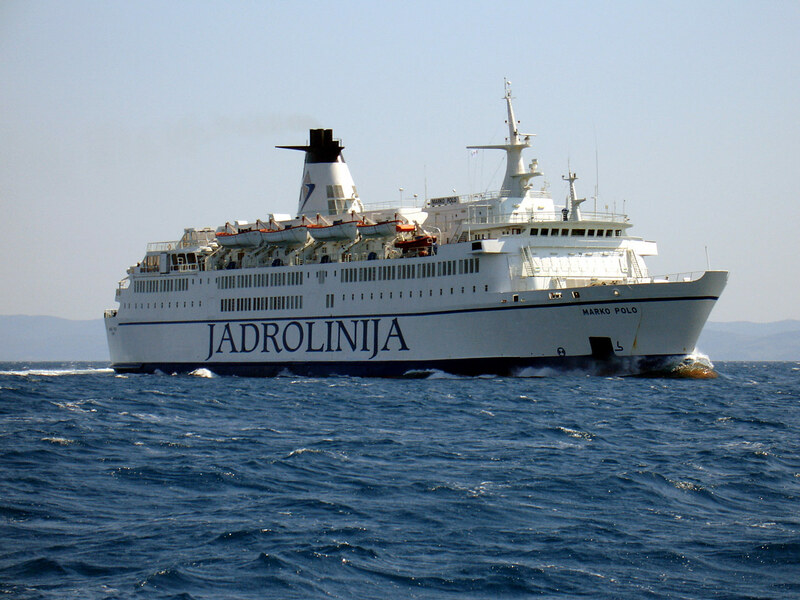 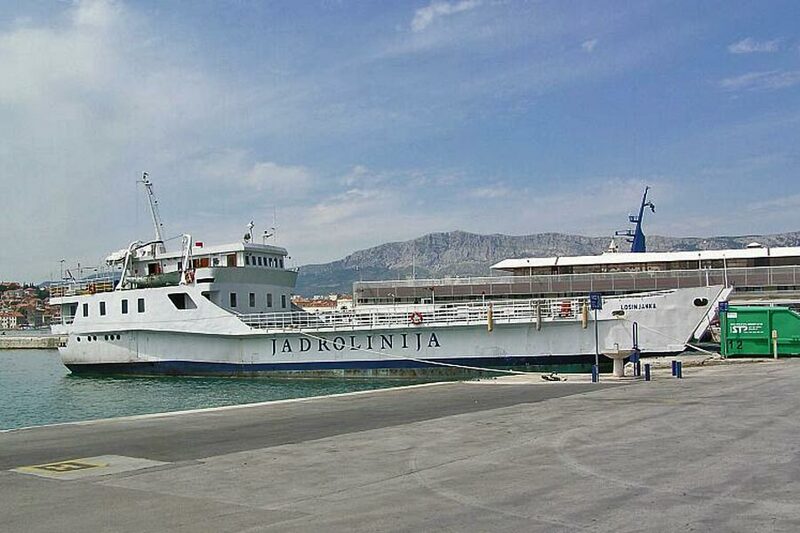 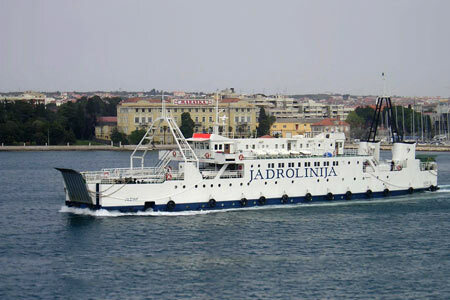 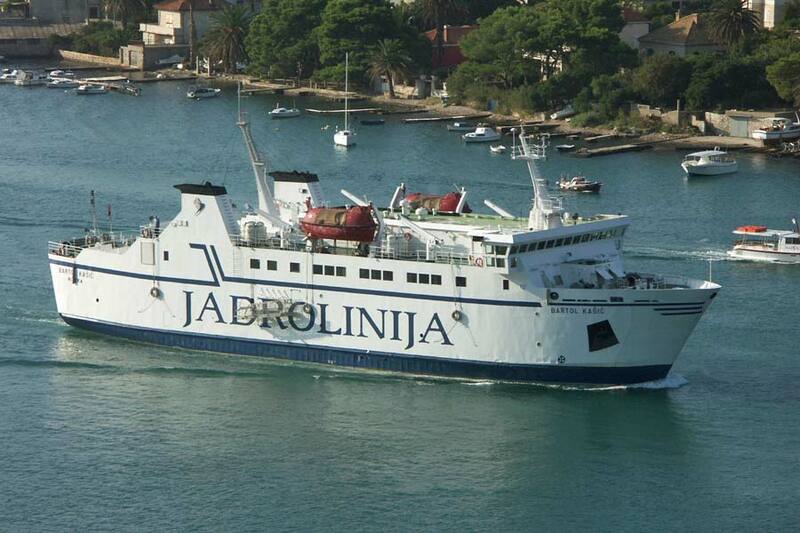 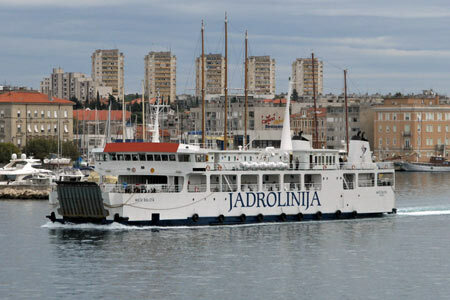 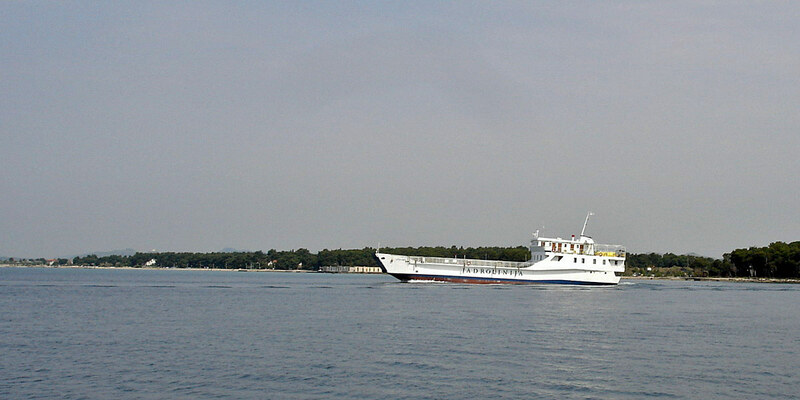 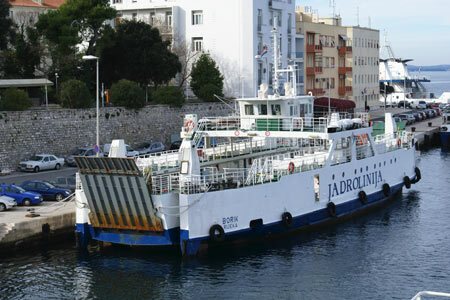 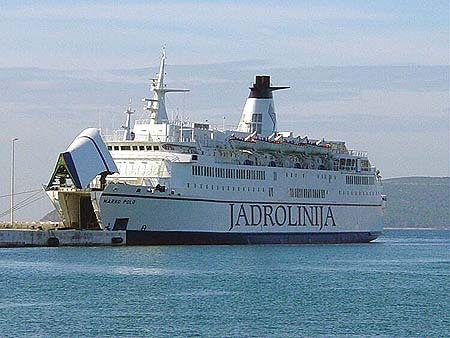 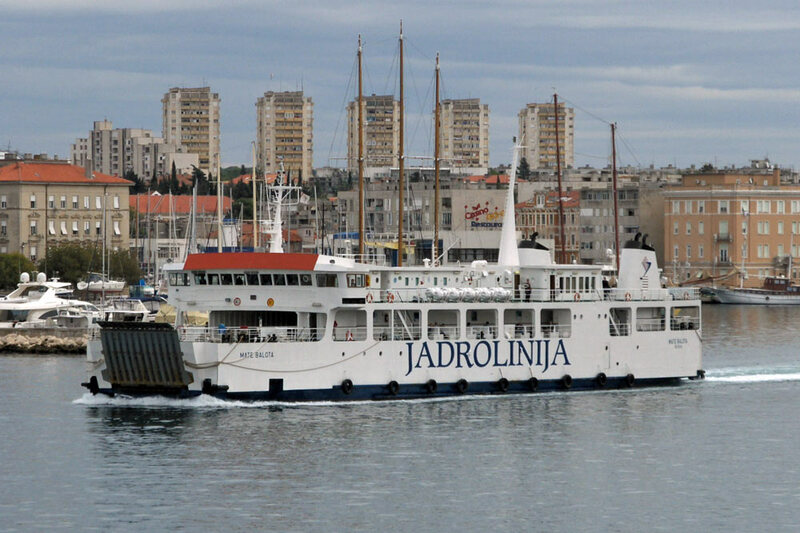 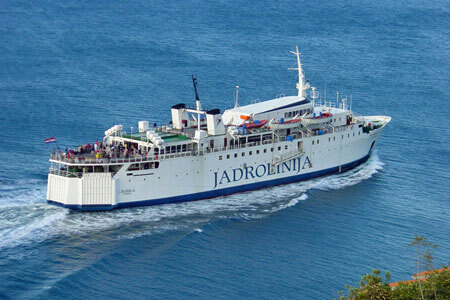 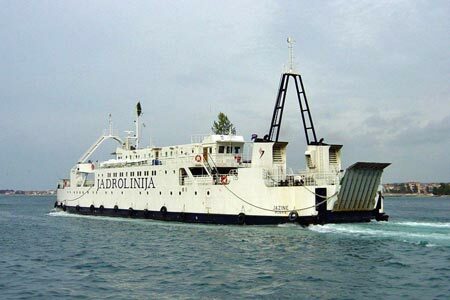 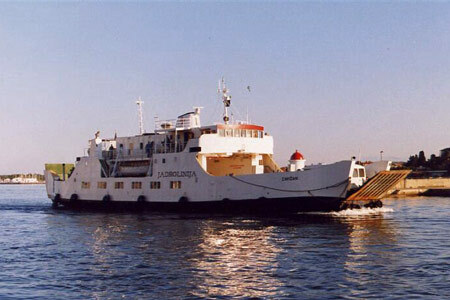 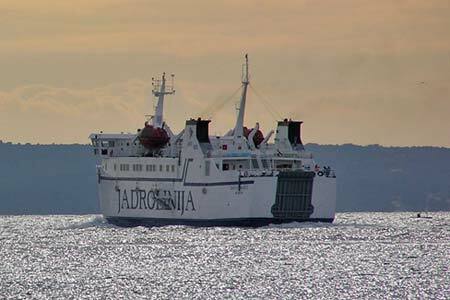 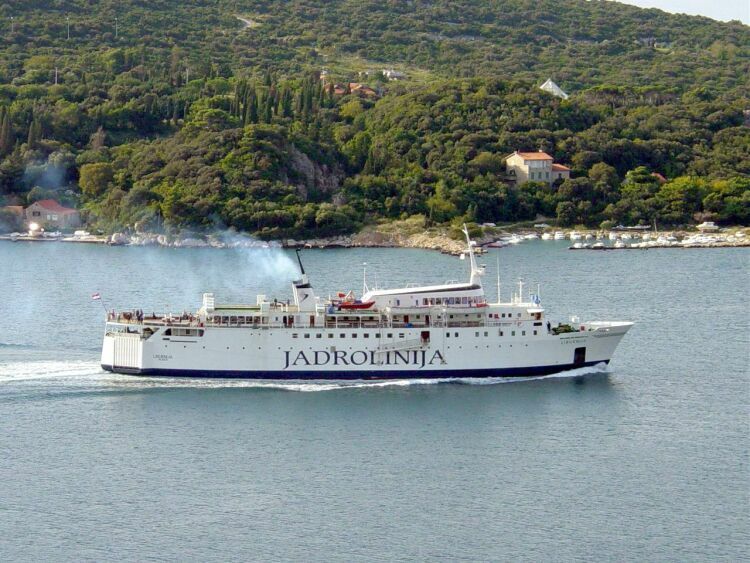 Split in 2005, and she remains in service in 2008.
ex-Jadrolinija ferry as Polace of SEM Marina. 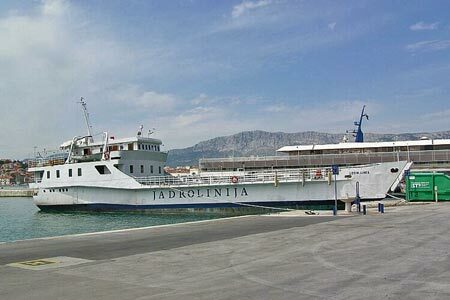 1979 reconstruction 239 bt,lenght increse to 30,35 m.
1998 new owner - Sangulin d.o.o.Biograd na moru. 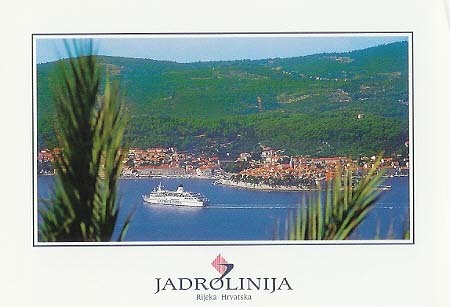 2005 new owner - Alan Putica & Zoran Prizmic from Dubrovnik. 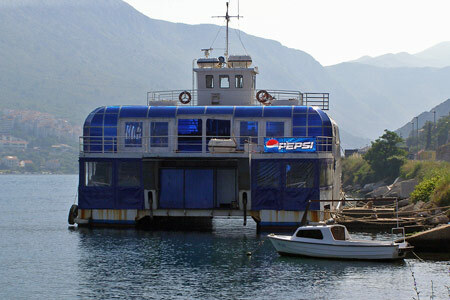 Rebuilt as disco club & restaurant. 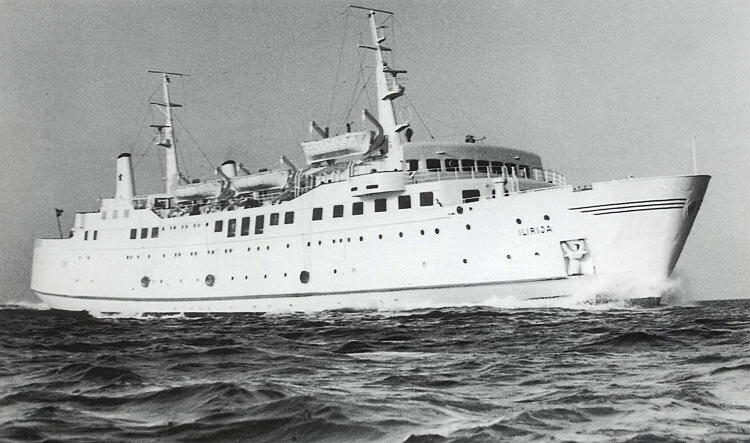 Liburnija was built in 1965 by the NV Scheepswerf & Machinefabriek " De Mervede" Van Vliet & Co, Hardinxveld, Holland. She entered service from Jugoslavia to Greece and Italy. Losinjanka was built in 1969 for Jadrolinija by Brodogradiliste Kraljevica, Kraljevica. 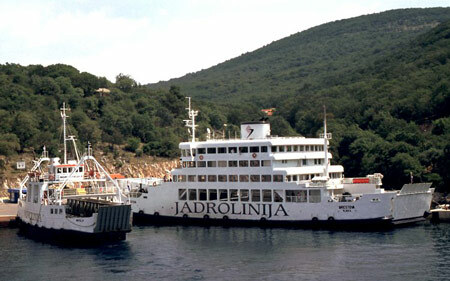 Sisters were Krcanka, Peljescanka and Soltanka. She has served on Split-Rogac, Zadar-Branj-Rava and Drvenik Veli-Drvenik Mali-Trogir. 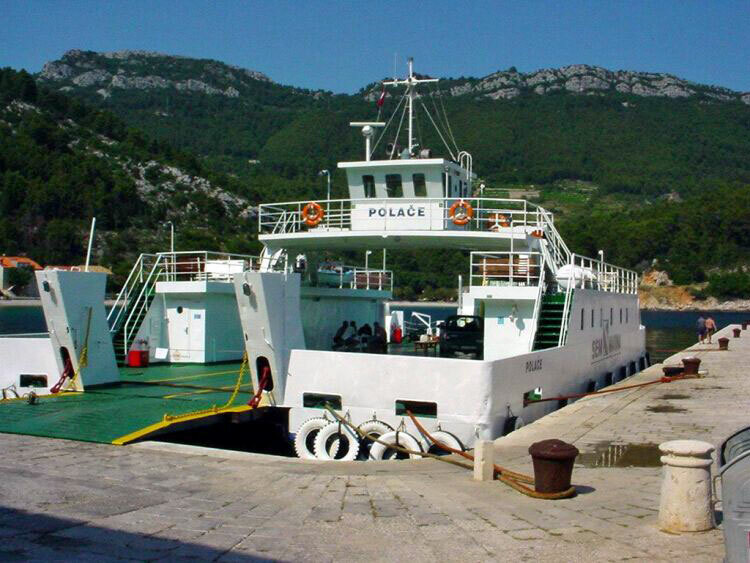 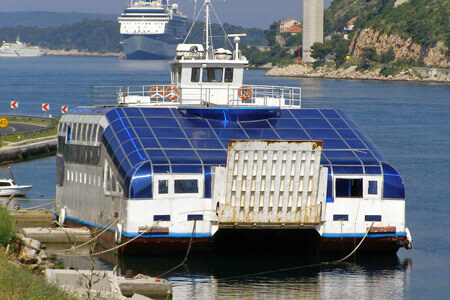 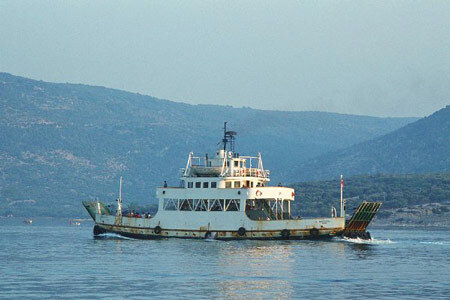 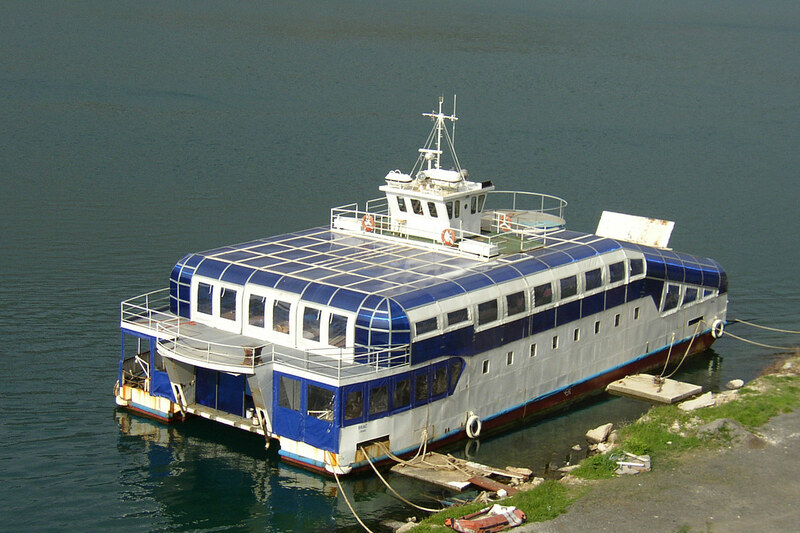 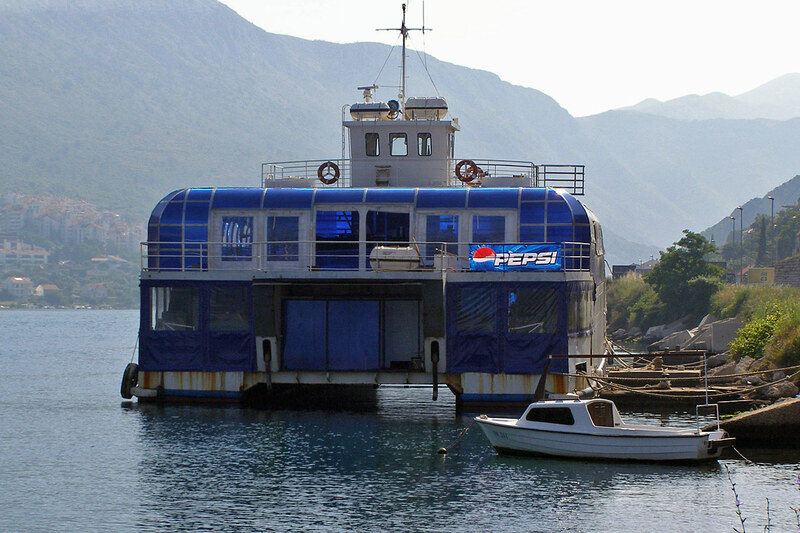 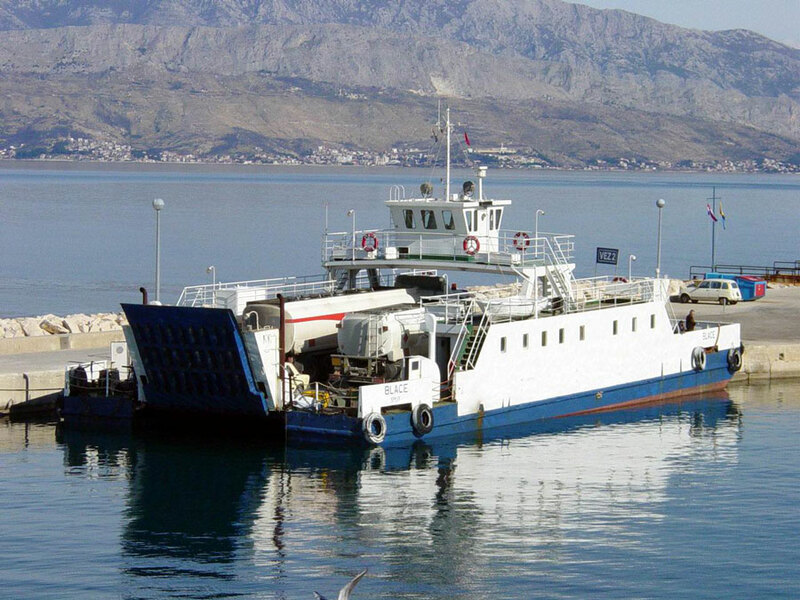 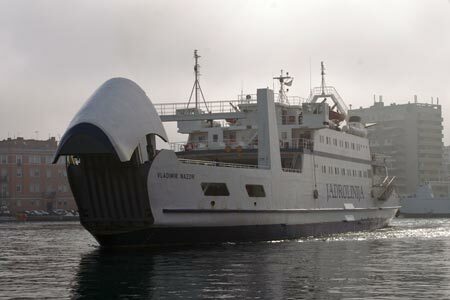 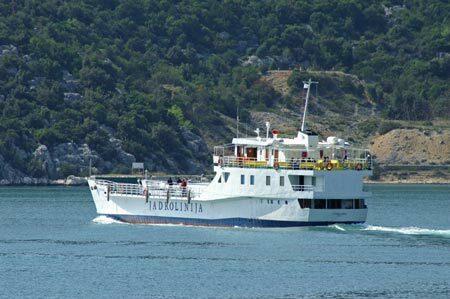 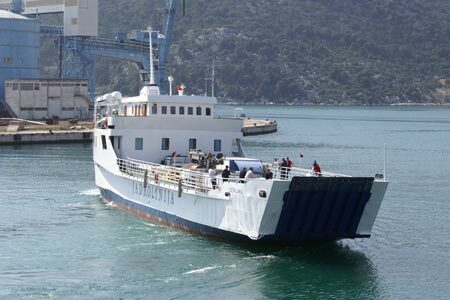 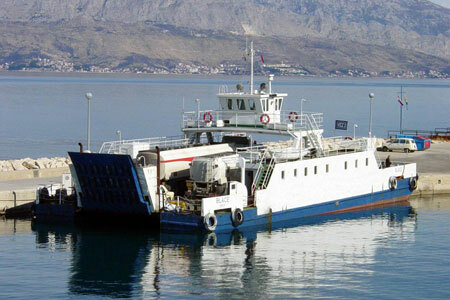 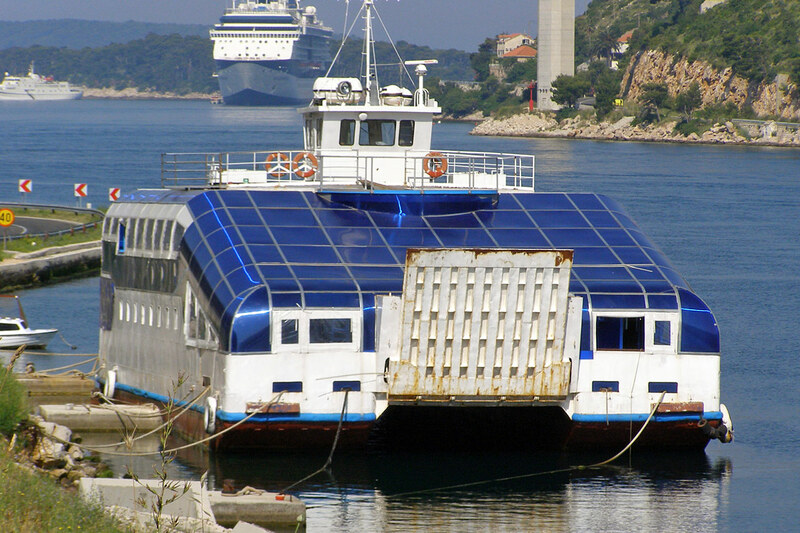 In 2007 she was in use between Ploce and Trpanj. 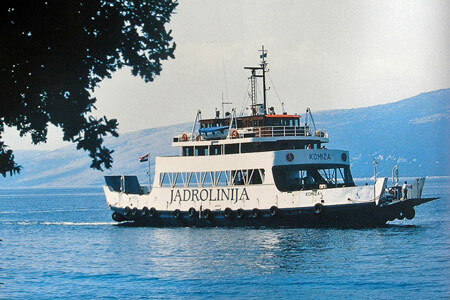 Krcanka was built in 1970 for Jadrolinija by Titovo Brodogradiliste, Kraljevica. Sisters were Losinjanka, Peljescanka and Soltanka. Peljescanka was built in 1971 for Jadrolinija by Titovo Brodogradiliste, Kraljevica. 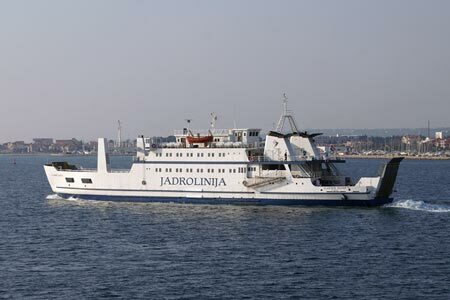 Sisters were Losinjanka, Krcanka and Soltanka. Soltanka was built in 1970 for Jadrolinija by Titovo Brodogradiliste, Kraljevica. 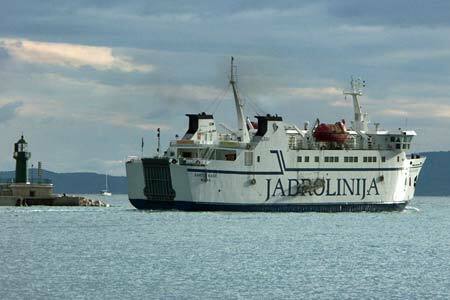 Sisters were Losinjanka, Peljescanka and Krcanka. From 2005 she operated between Ploce and Trpanj, but in April 2007 she had been replaced by sister Losinjanka on this route. 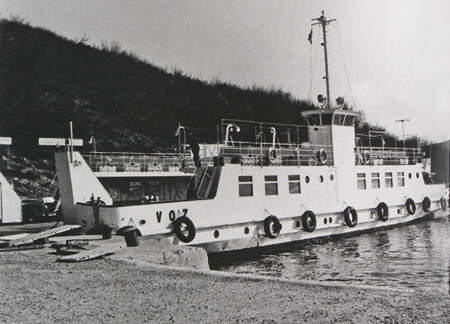 Ero was built as Ærø for Danish comapnay A/S Dampskibsselskabet Ærø, Ærøskøbing, and used between Ærøskøbing and Svendborg. 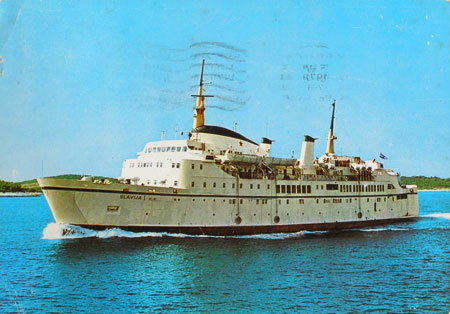 She was sold to Olbalna Plovidba, Split, in 1968 and renamed Ero. 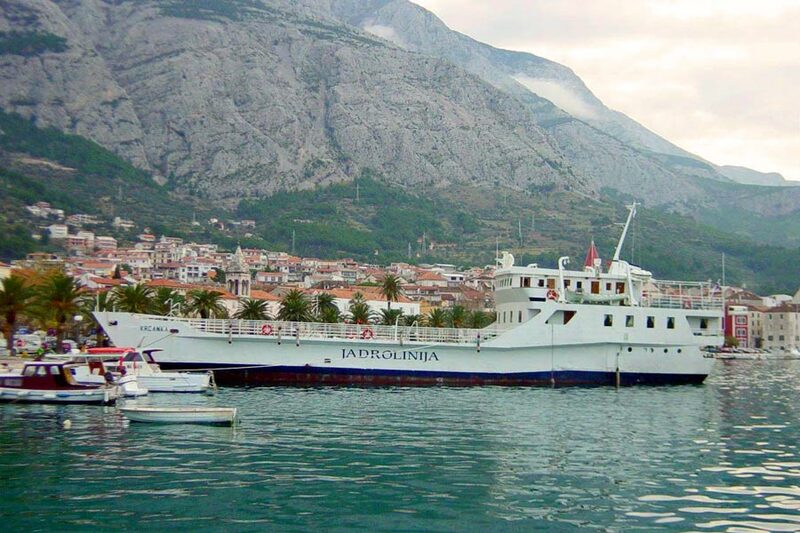 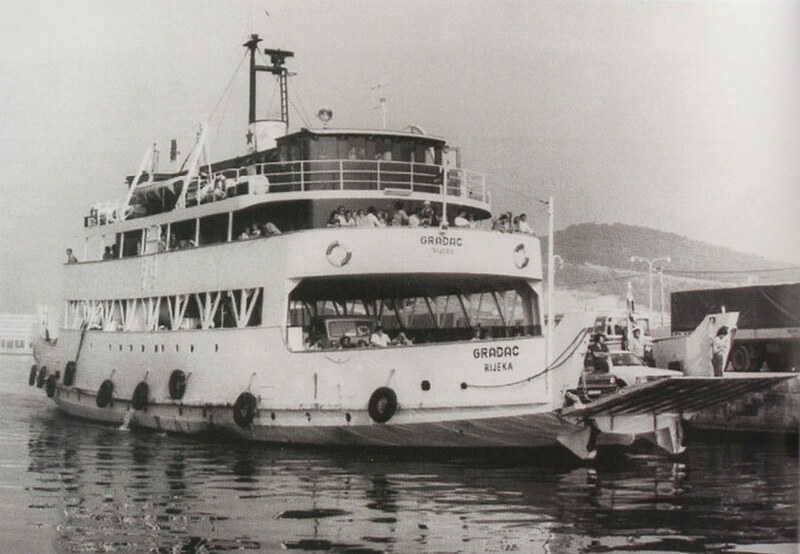 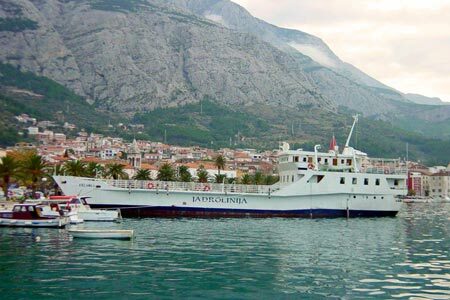 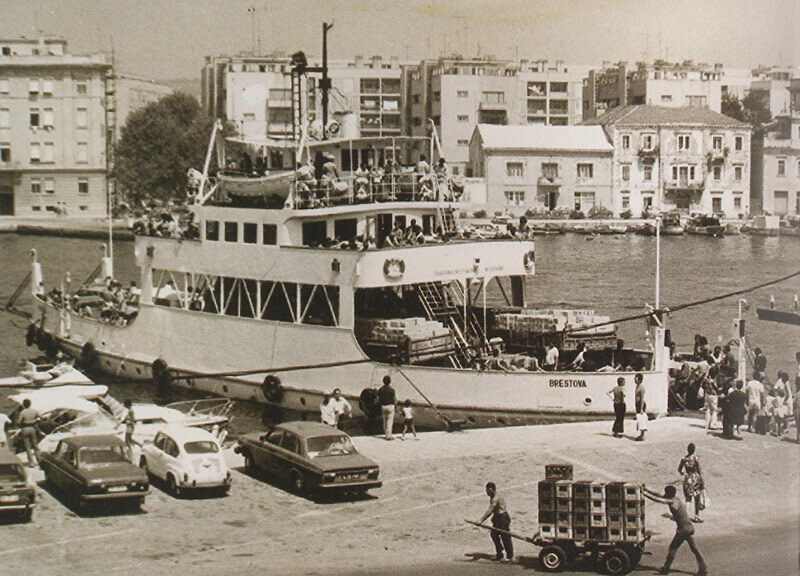 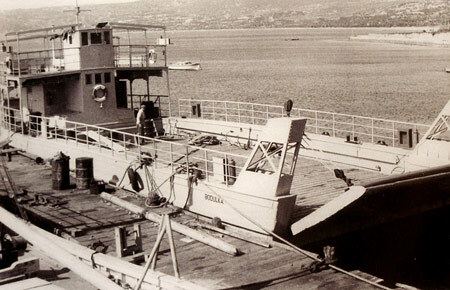 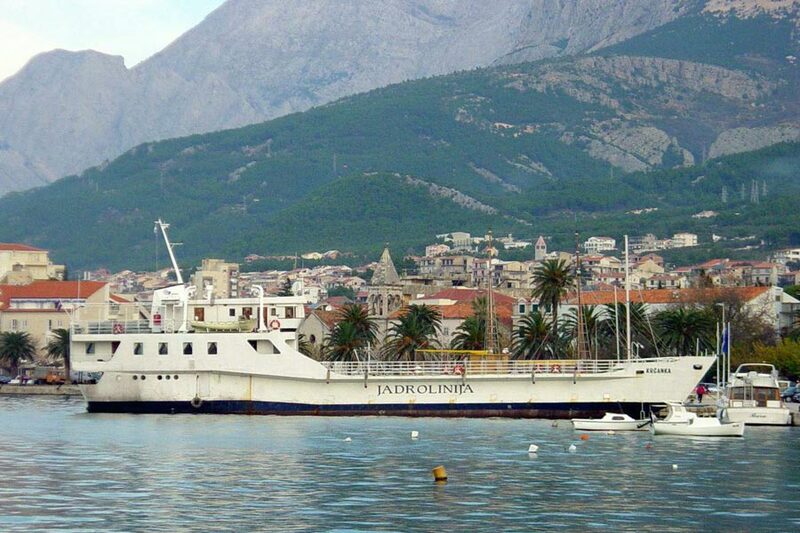 She passed to Jadrolinija in 1971, running services from Makarska. She no longer operates and is due to be decomissioned. Ilirija was built as Bornholmerpilen in 1963 by Jos L Meyer Verft, Papenburg-Ems, for A/S Bornholmsfærgen af 1962 (Bornholmstraffiken from 1975). 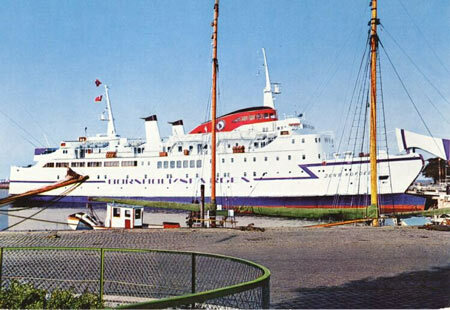 She was used on routes Copenhagen-Rønne and Rønne-Ystad. 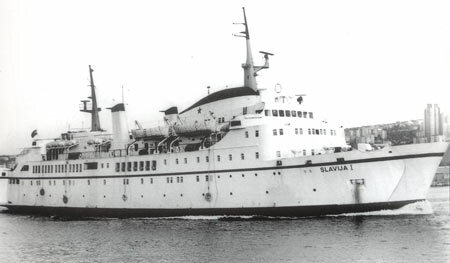 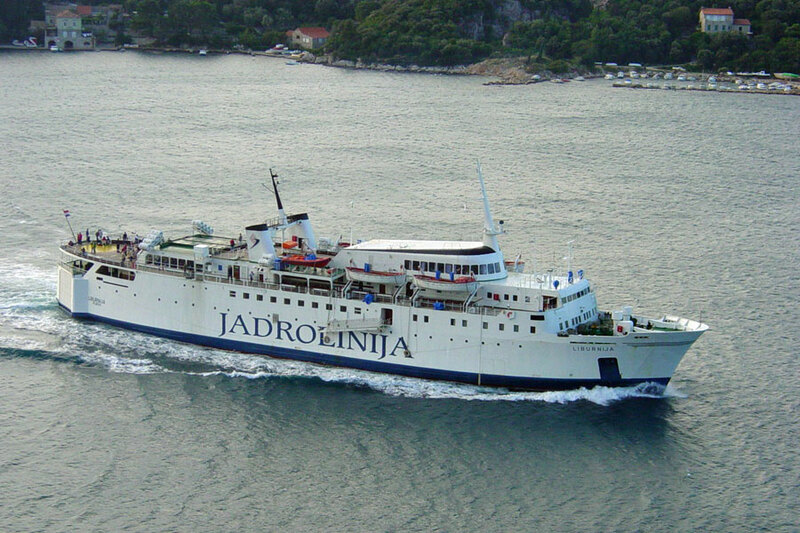 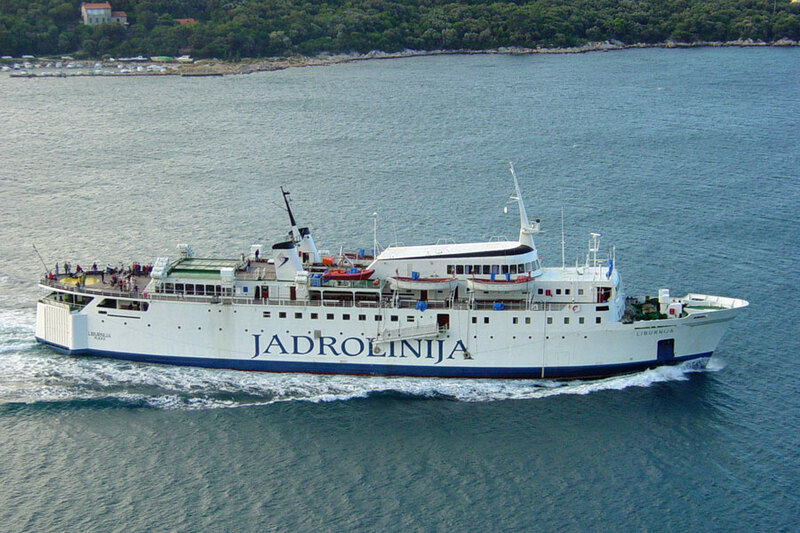 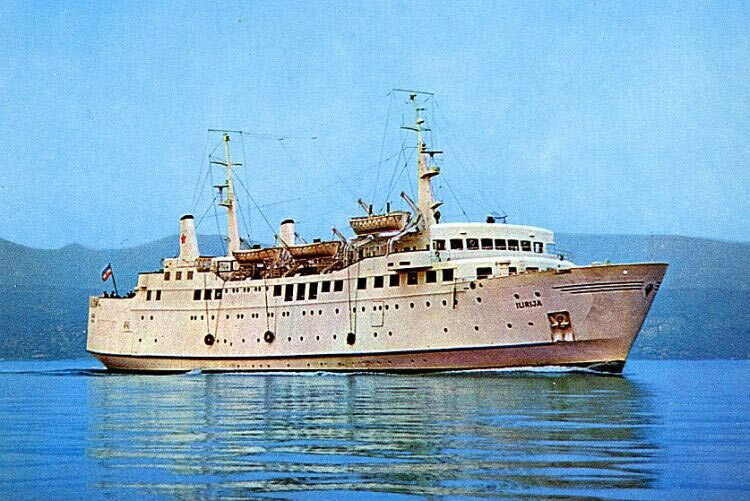 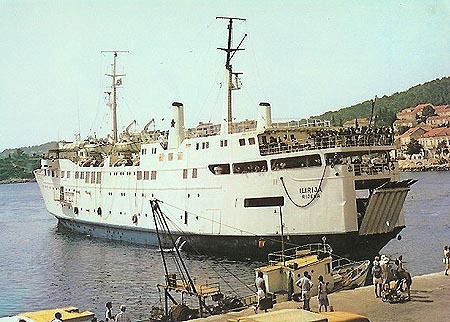 In 1971 she was sold to Jadranska Linijska Providba, Rijeka (Jadrolinija) and renamed Ilirija for service Rijeka-Dubrovnik. 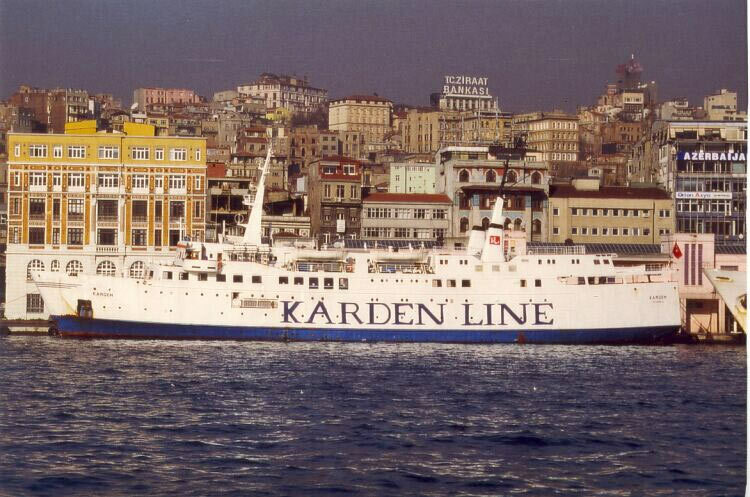 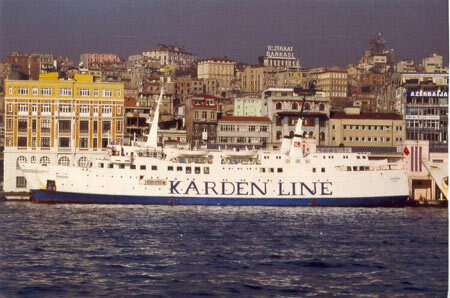 Since 1997 she sailed as Kargem and Avrasya II for Turkish owners. 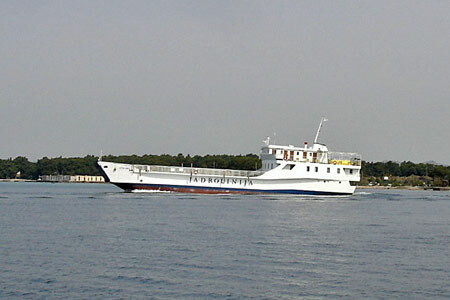 She was scrapped in 2006. 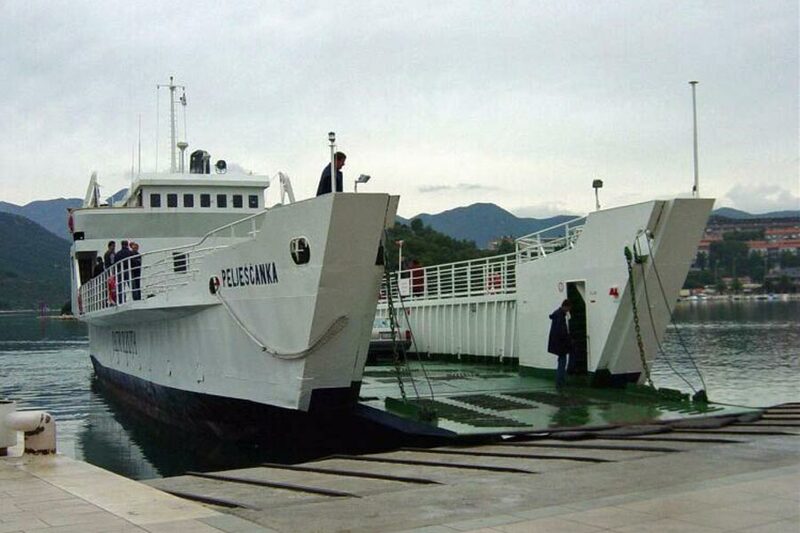 2005 new name AVRASYA, owner Trabzon Birselik Denizcilik A.S., flag DNR Korea. 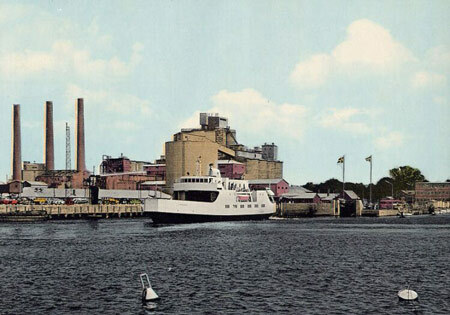 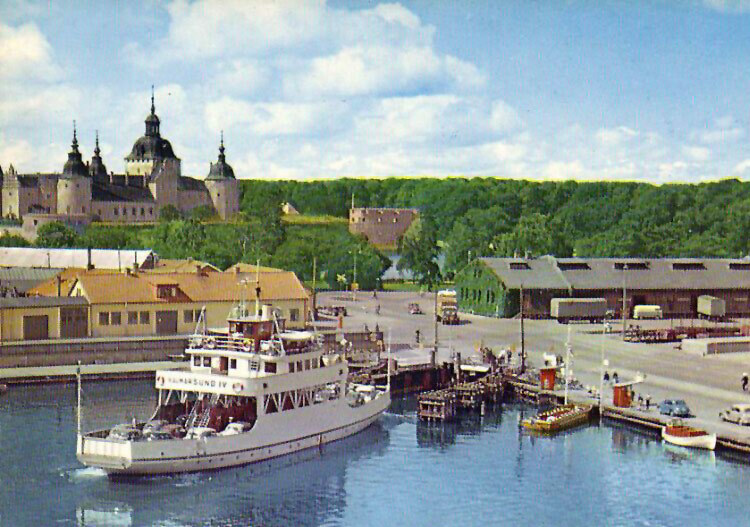 Bornholm company postcard of Bornholmerpilen. 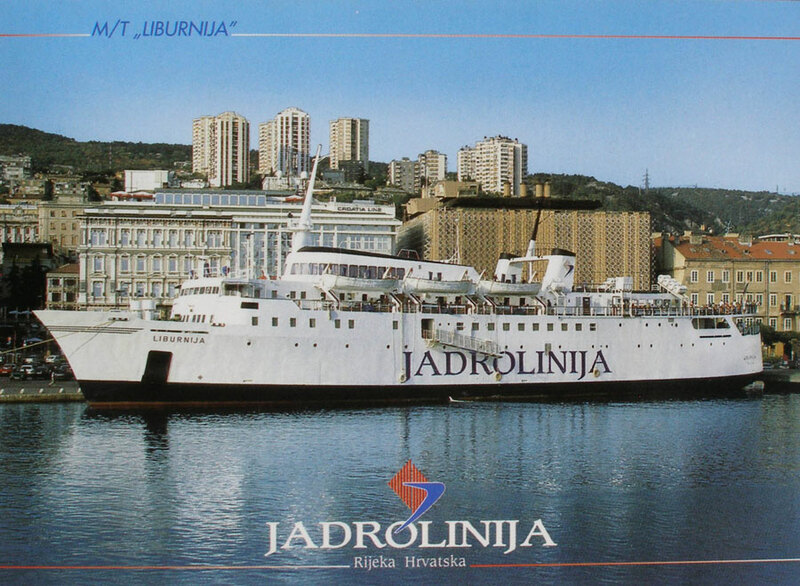 Nakladatelstvi Svepomoc (Prague) postcard of Ilirija. 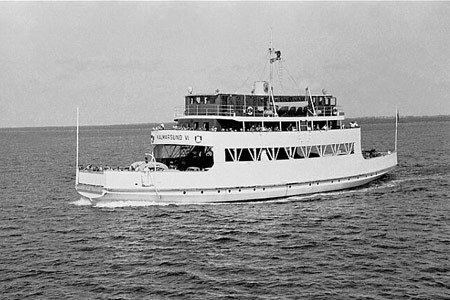 Photo: &COPY; Jan Vinther Christiansen - Scan: Fakta om Fartyg. 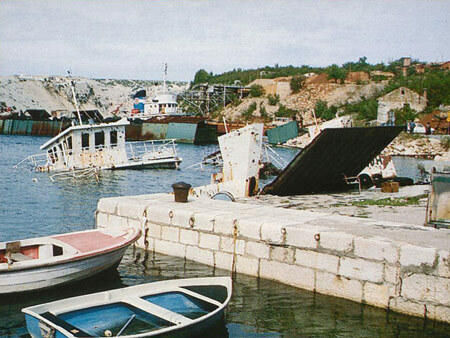 Photo: &COPY; Niels Wegener - Scan: Fakta om Fartyg. 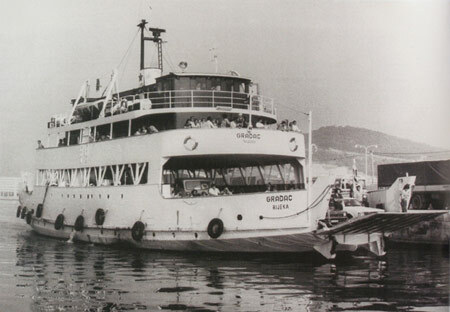 Photo: &COPY; Selim San - Scan: Fakta om Fartyg. 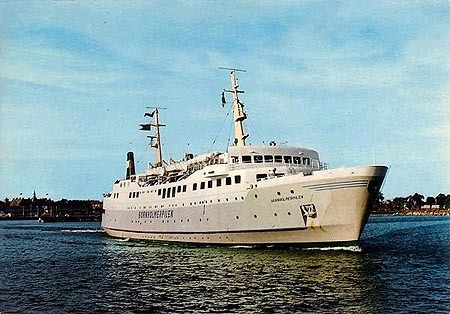 Skipper Clement was built as Jens Kofoed (1) in 1963 by Bremer Vulkan, Bremen, for A/S Bornholmsfærgen af 1962. 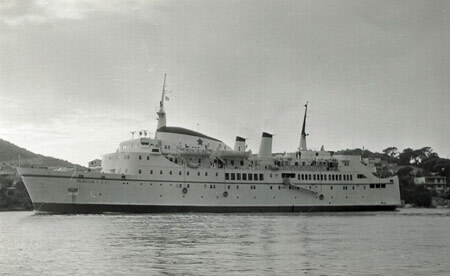 Her hull had been built by Bartram & Sons, Sunderland, but was towd to Bremen for completion. 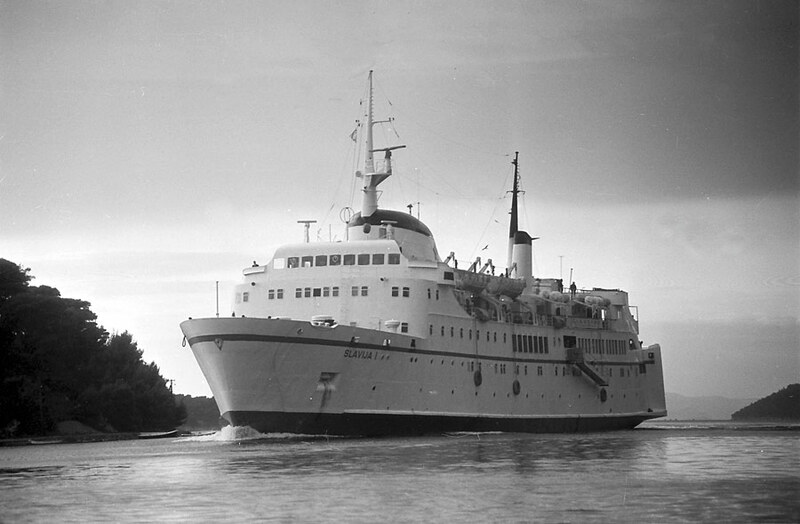 She entered service in August 1963 from Copenhagen to Rønne and Ystad. 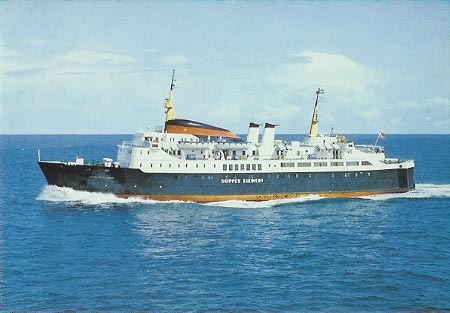 In 1964 she was sold to DFDS and was renamed Skipper Clement. 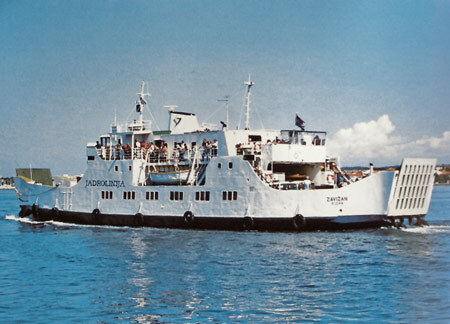 She ran on various DFDS domestic Danish services (Copenhagen-Aarlborg/Århus/Frederikshavn) plus Oslo-Frederikshavn and Oslo-Aarlborg. She also covered on the Odden-Ebeltoft service of Mols Line between 1966-1968 (an associated company at this time). 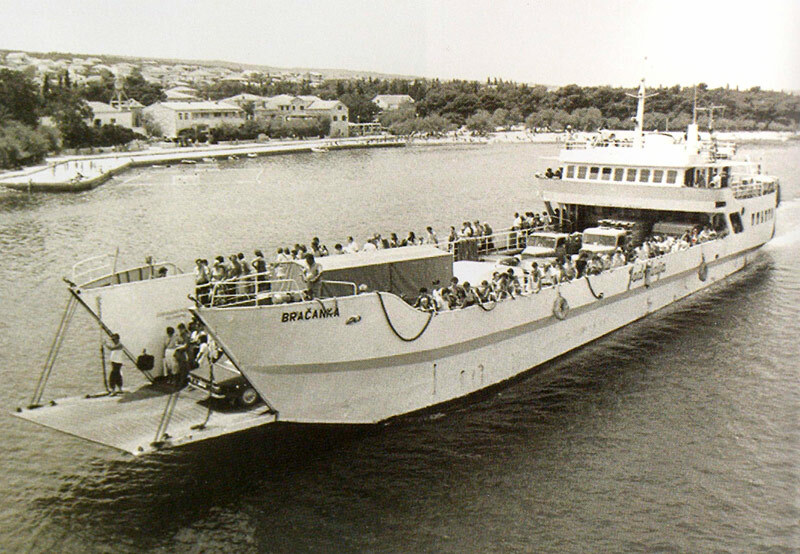 Services were cut back in 1974, and Skipper Clement was chartered to Aznar in summer 1975, folowed by a charter to Jadrolinija as Slavija in 1976 with a purchase option. 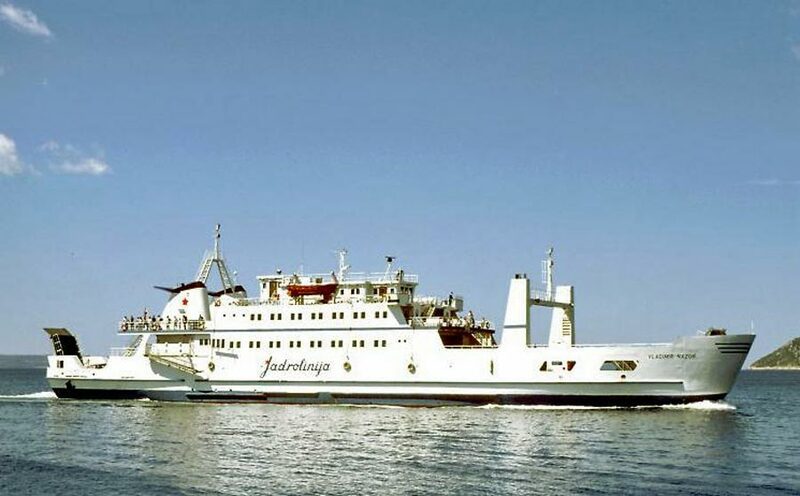 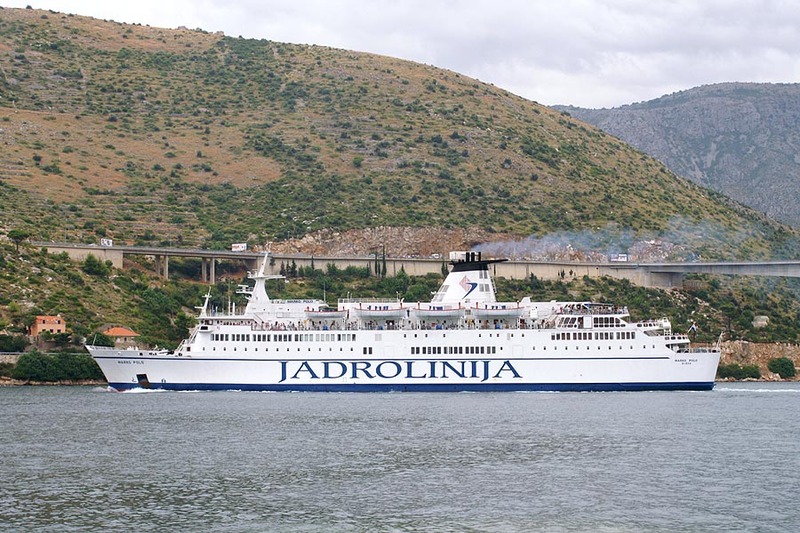 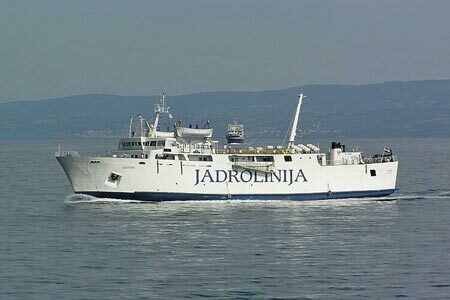 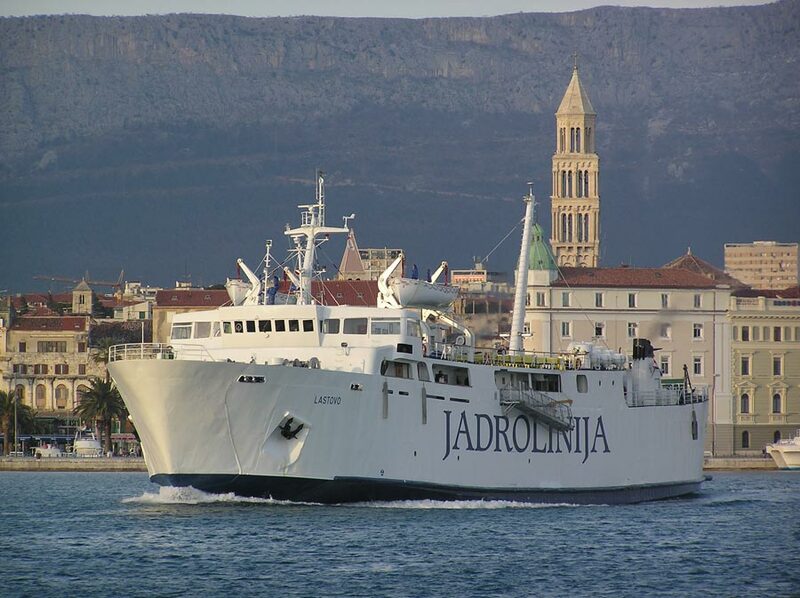 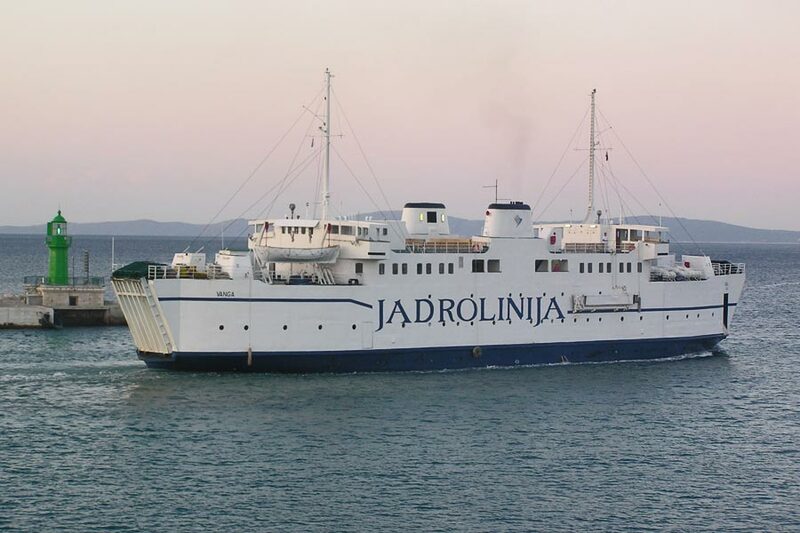 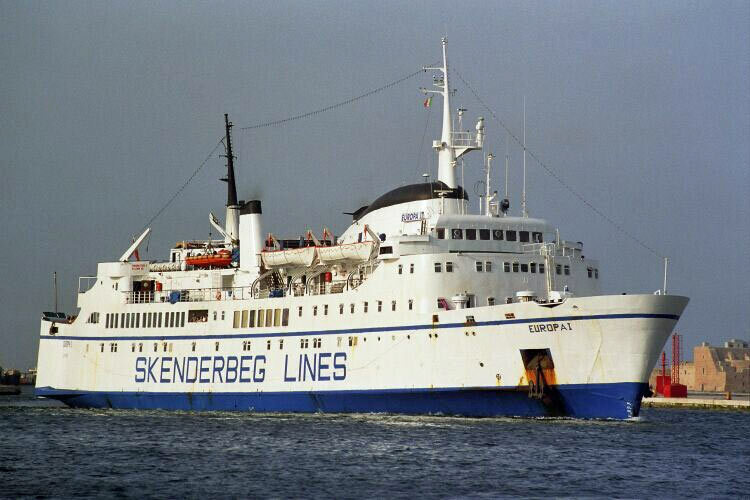 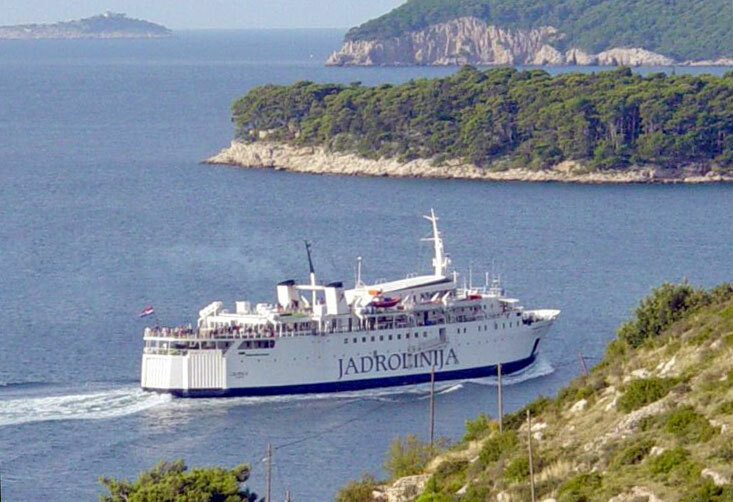 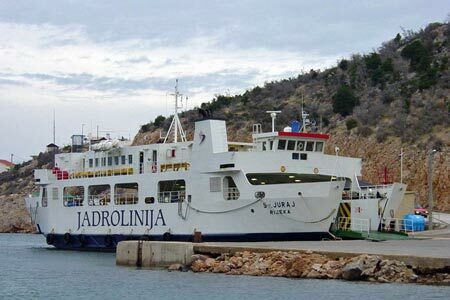 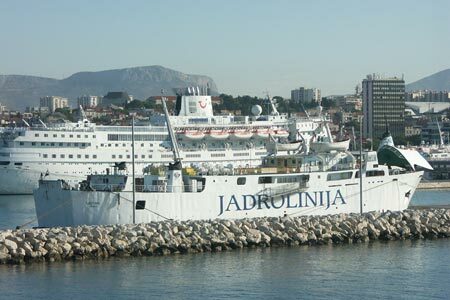 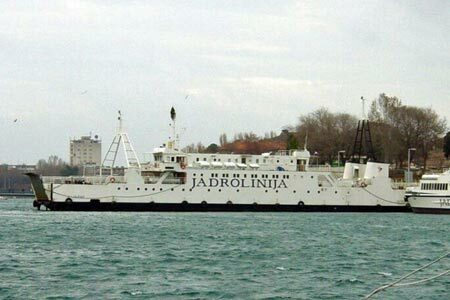 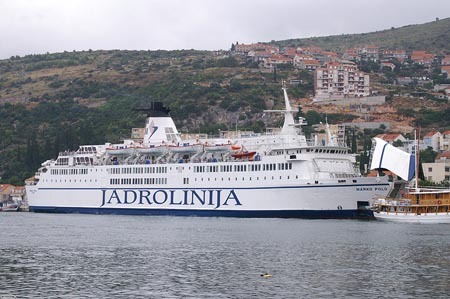 The option was taken up and she was renamed Slavija I. Slavija I ran on Jadrolinija services until 1998 when she was sold for use by Skenderbeg Lines between Brindisi and Valona as Europa I. Photo: &COPY; Andreas Wörteler - Scan: Fakta om Fartyg. Photo: &COPY; Jan Vinther Christensen - Scan: Fakta om Fartyg. Vis (2) was built as Sydfyn in 1965 by Flensburger Schiffbaugesellschaft for Nordisk Færgefart A/S, Faaborg, Denmark. She operated on the Gelting-Faaborg route until replaced in 1976 by the Gelting. 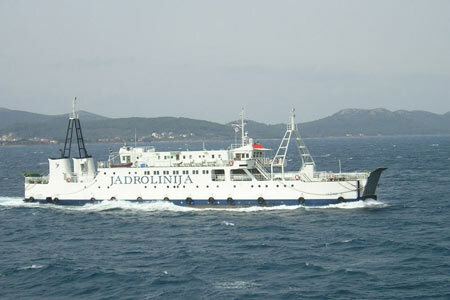 She was sold to Jadranska Linijska Plovidba (Jadrolinja) as the Vis, remaining in service in 2008. 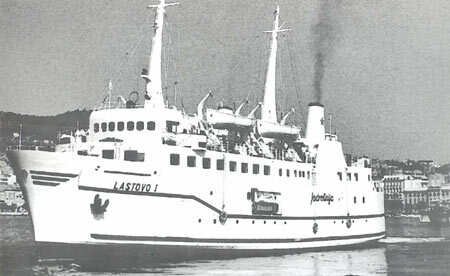 Lastovo I (1) was built as Kraakerø for A/S Birger Svendsen & Söner, Fredrikstad, Norway, in 1964, by Langesunds M.V. 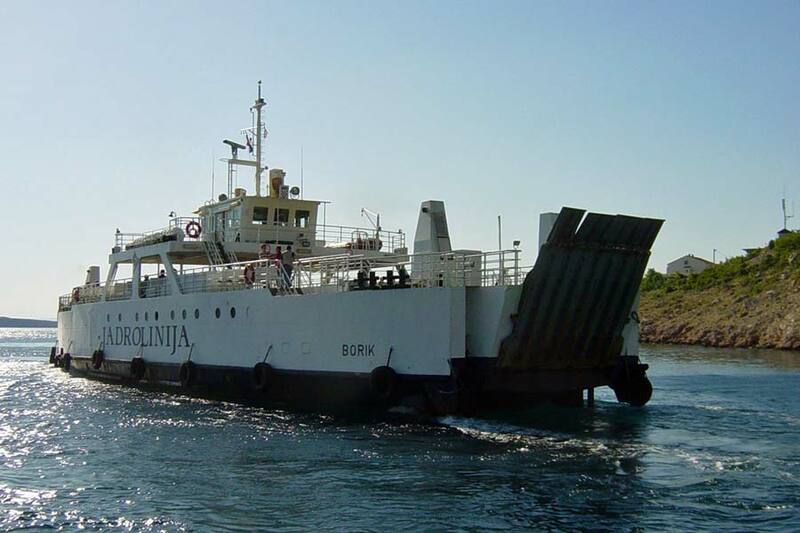 A/S, Langesund. 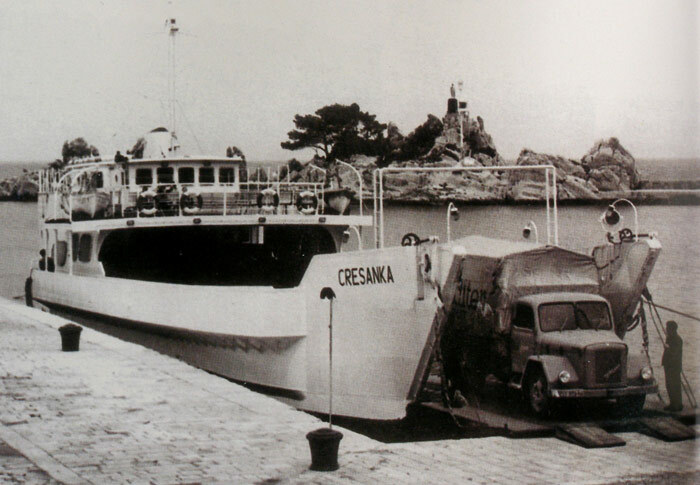 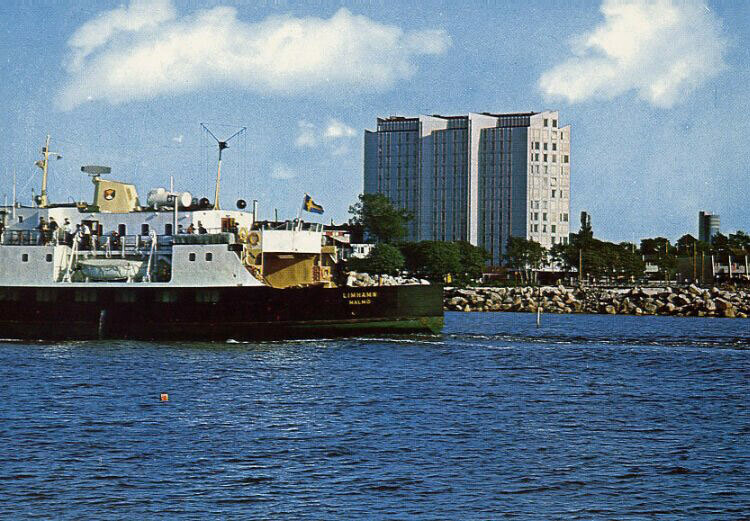 She entered service in June 1964, between Strömstad and Kragerø, soon moving to Arendal-Lysekil and Kragerø-Skagen. Kraakerø was sold in October 1964 to Rederi Ab G.H. 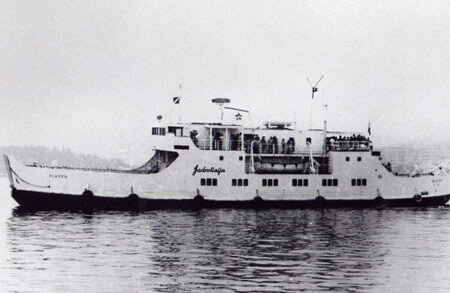 Linjen, Höganäs as Gilleleje, for service between Höganäs and Gilleleje. 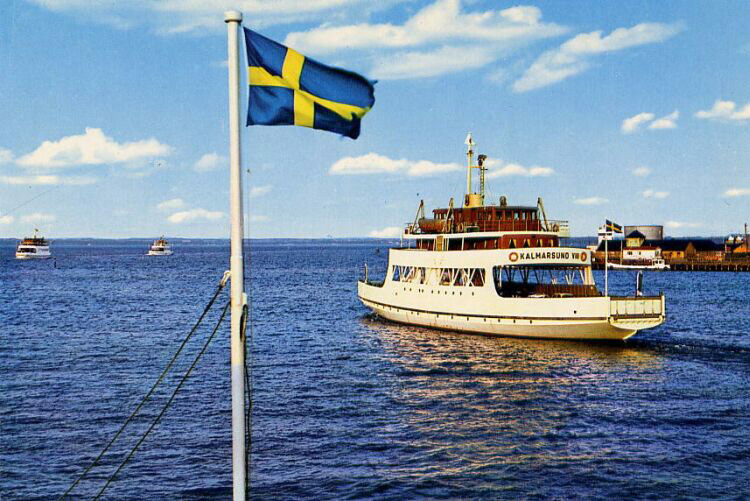 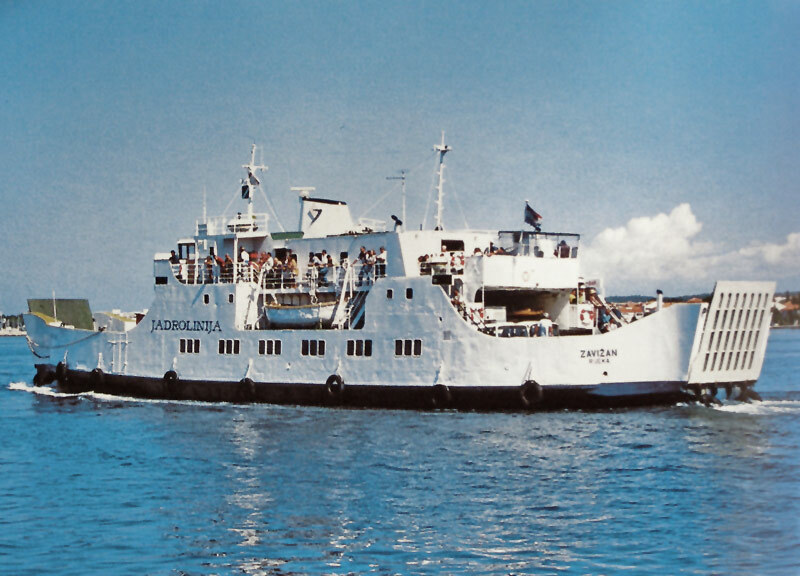 During the summer of 1965, she was chartered to Rederi Ab Nordö, Oskarshamn, for service between Oxelösund and Kappelshamn. 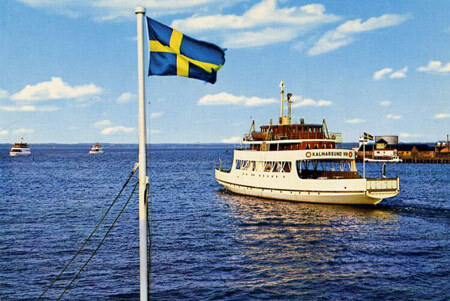 In November 1965 Gilleleje was sold to Rederi Ab Gotland, and was renamed Polhem (2). During the summer of 1966 she served Västervik-Visby-Grankullavik-Oskarshamn. 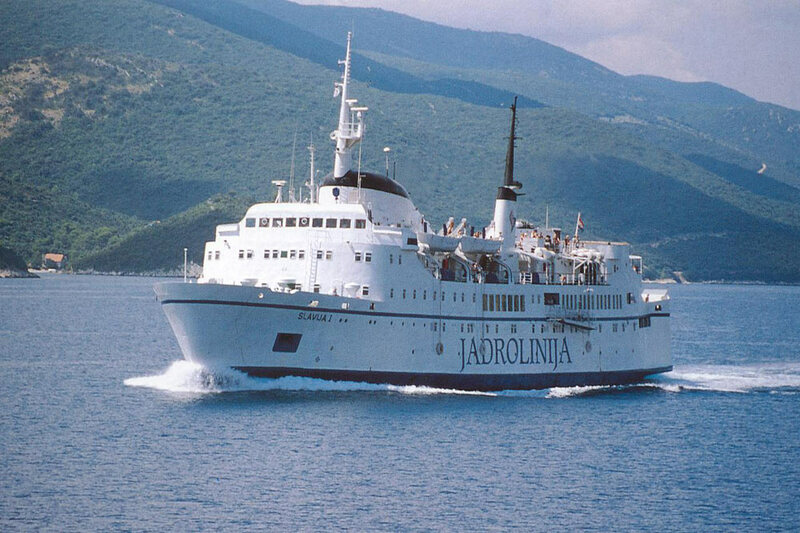 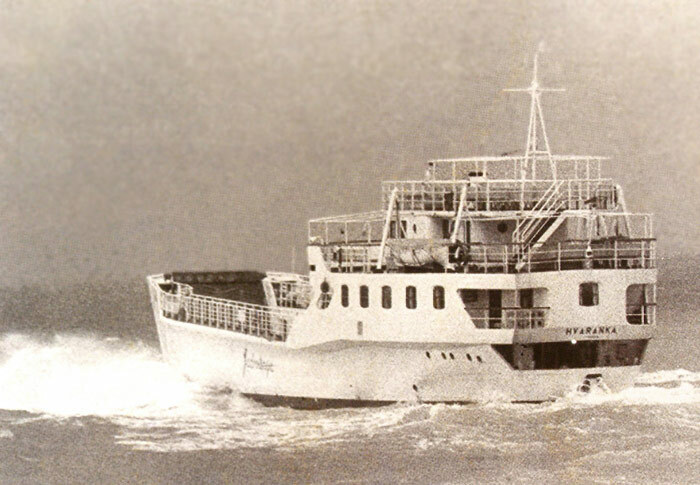 In April 1972, Polhem (2) was sold to the Tourship Group (Corsica Ferries) and adopted the name Corsica Ferry for sevice between Bastia and Livorno.In 1976 Corsica Ferry was sold to Jadranska Linijska Plovidba, Rijeka (Jadrolinija) and renamed Lastovo I. 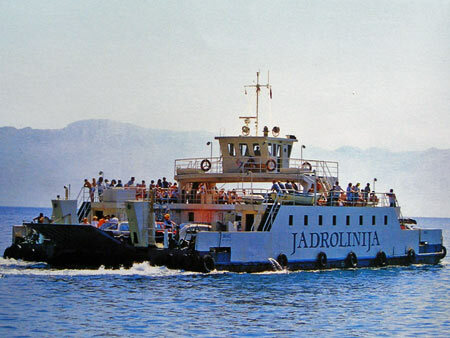 She initially ran Split-Hvar-Vela Luka-Ubli. 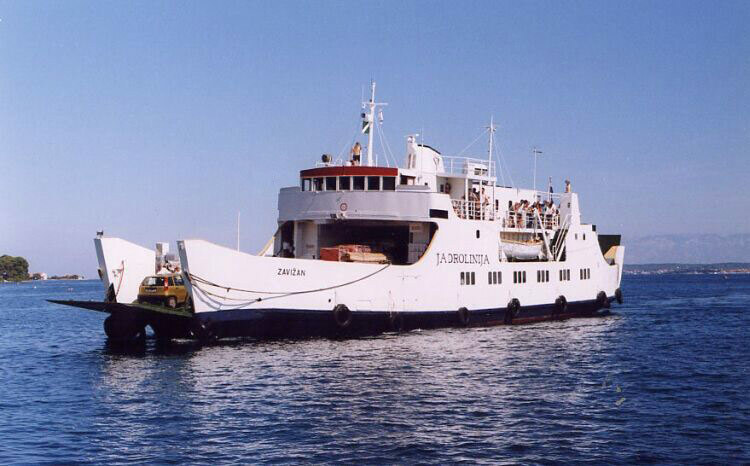 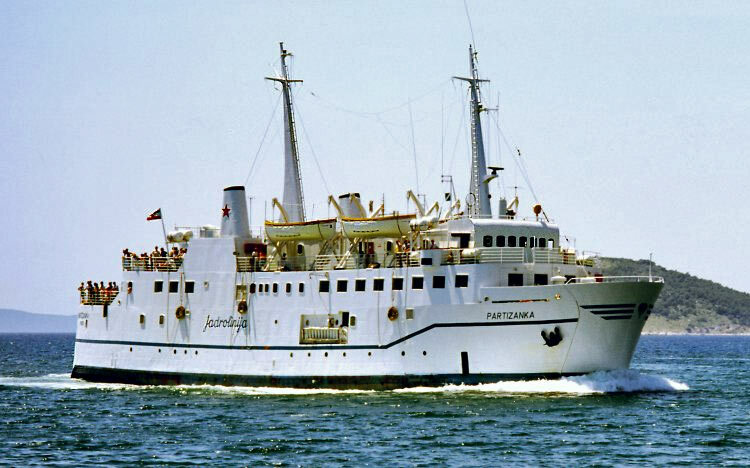 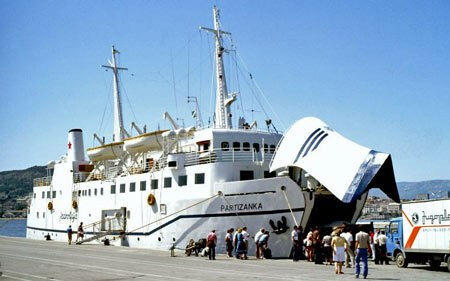 In 1978 she was renamed Partizanka (3), and then Ston in 1992. 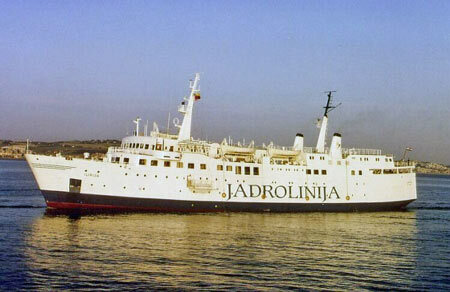 She was sold by Jadrolinija in 1996, subsequent names being Stone and Guniz. 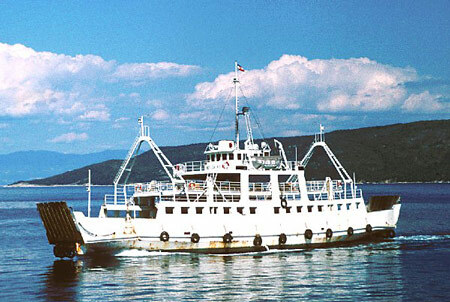 Borik was built by Titovo Brodogradiliste, Kraljevica, in 1978. In 2002 she moved to the Prizna-igljen route. Jazine was built by Titovo Brodogradiliste, Kraljevica, in 1978. Her dimensions are identical to Borik above (they have consecutive builder numbers), and Jazine was originally a sister. She was substantially rebuilt in 1988 by the Kraljevica shipyard, carries 480 passengers as opposed to 250. They were built specialy for route Zadar-Preko, but after ten years, they were too small for amaunt of traffic, so Jazine was lengthened by 20m. 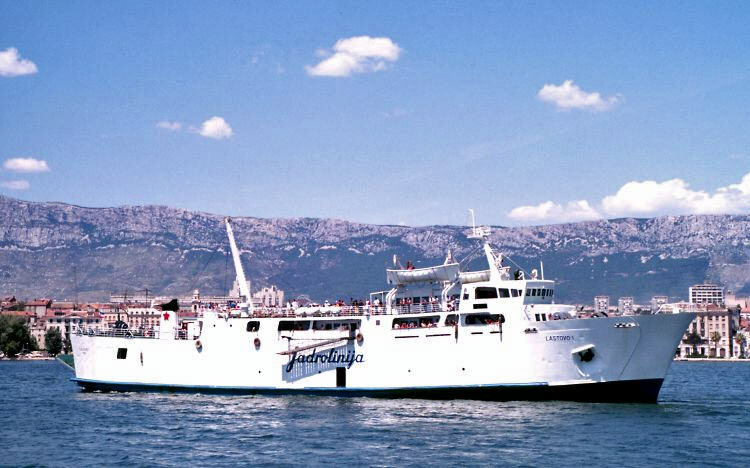 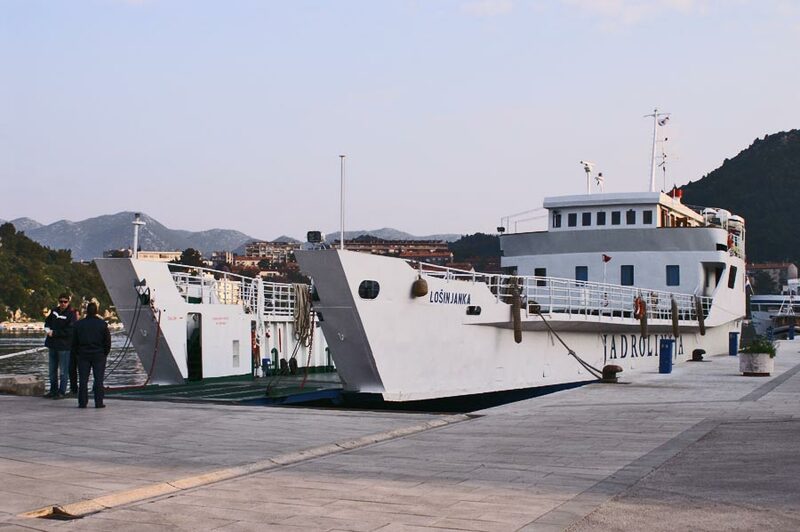 In April 2007 she was operating less busy services between Zadar and Preko, but during the year operated mostly on route from Zadar to Branj on island of I. 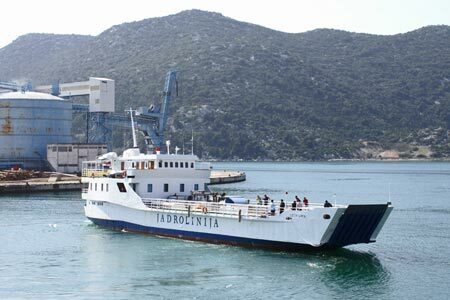 Lastovo was built in 1971 as the Ishizuchi for Japanese company Shikoku Chuo Ferry Boat K.K. 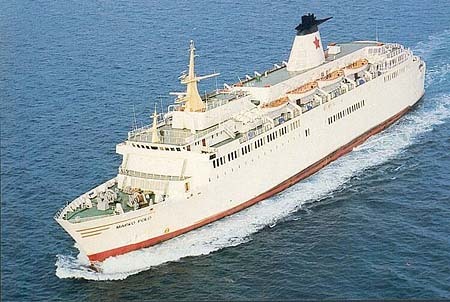 She served between Kawanoe and Kobe. 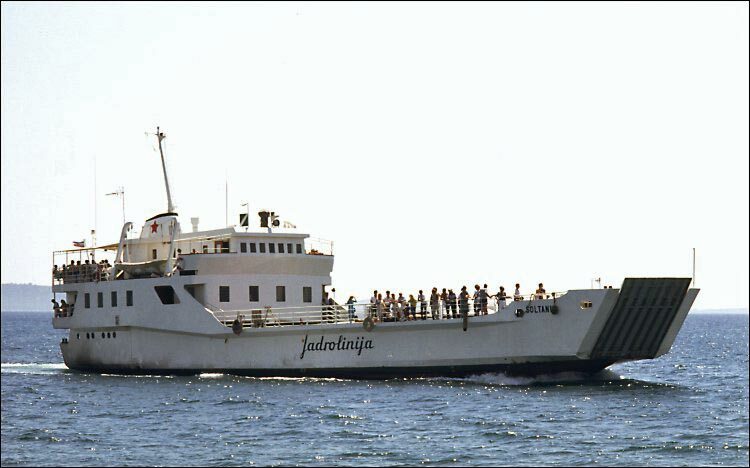 Ishizuchi was bought by Jadrilinija in 1978, and was initially named Partizanka (2). 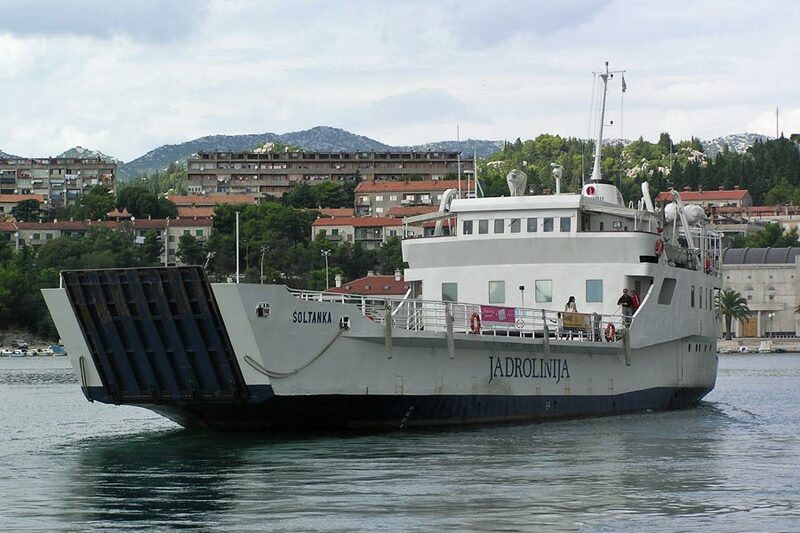 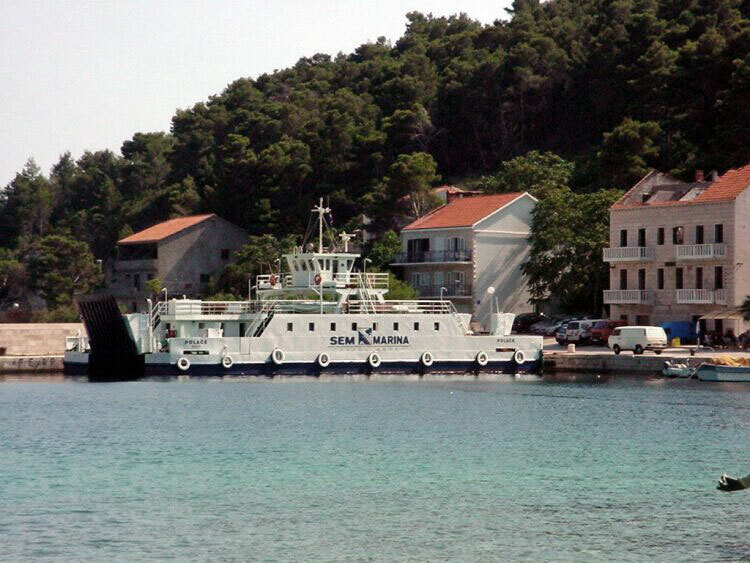 She entered service as Lastovo I (2) between Split-Hvar-Vela Luka-Ubli. 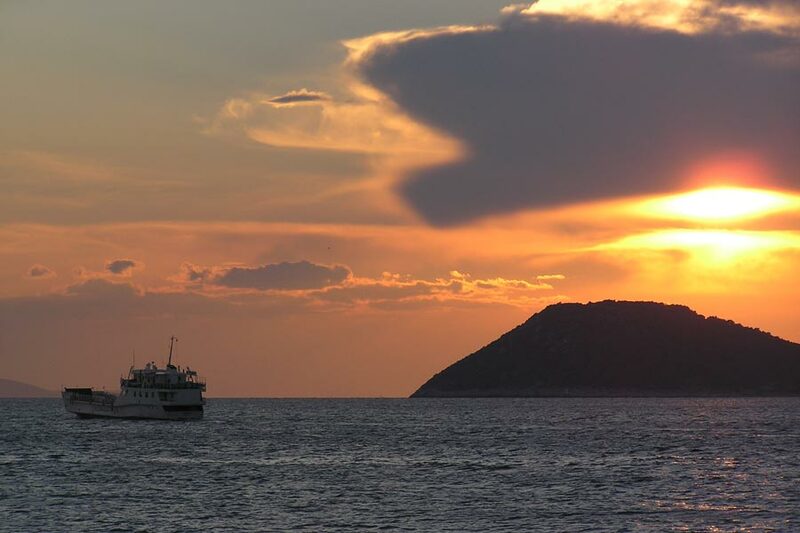 In 1999 she was renamed Lastovo, and continues to operate various services out of Split. 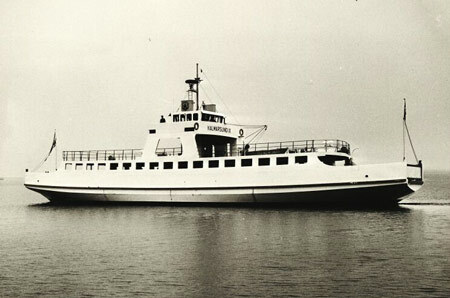 Balkanija was built as Mette Mols (1) in 1966 by Aalborg Vaerft A/S, Ålborg, Denmark for the Mols Linien service between Sjællands Odde and Ebeltoft. 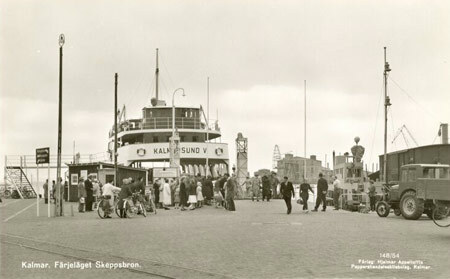 Her sistership was Maren Mols (1). 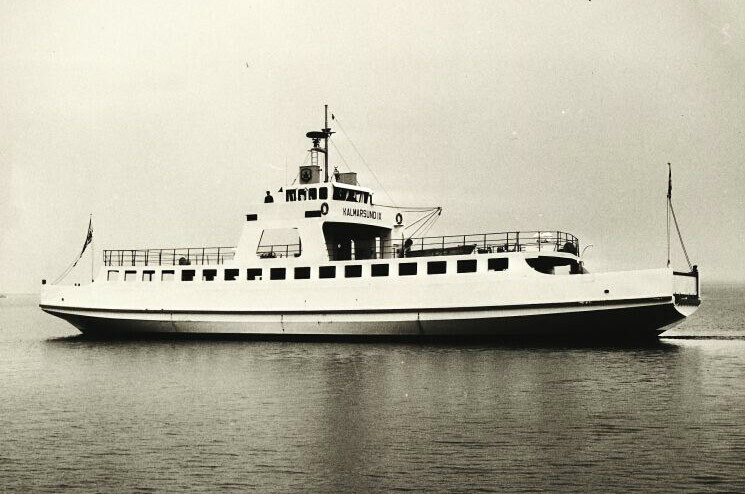 In 1974 Mette Mols (1) was renamed Mette Mo to release the name for the new Mette Mols (2). 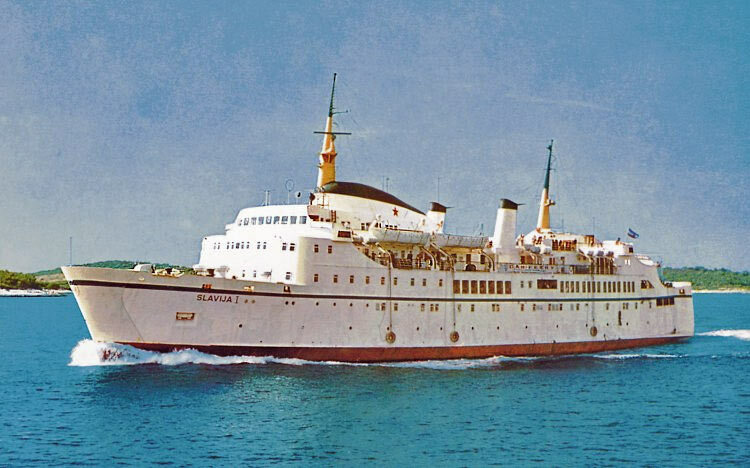 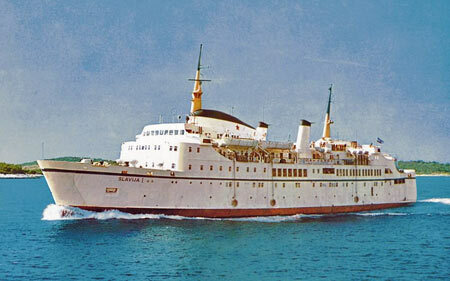 She was laid up soon afterwards, until sold to DFDS in 1977 as the Dana Gloria. 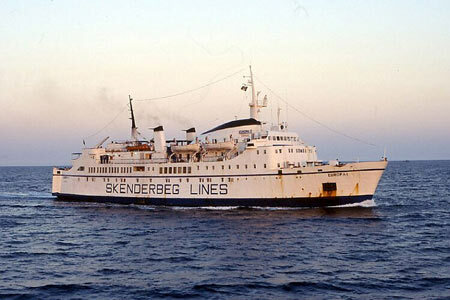 She then briefly reappeared on the Sjællands Odde-Ebeltoft route under charter to Mols Linien. 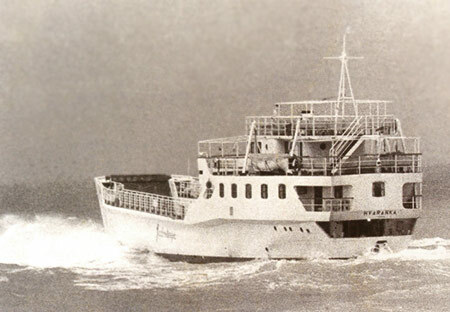 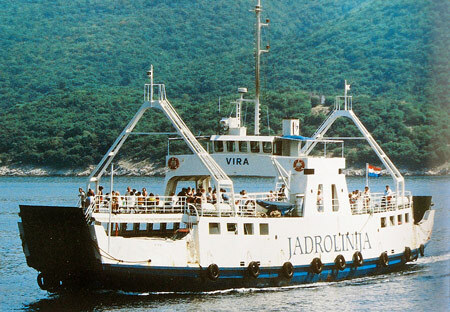 Other charters followed for Viking Line, Fåborg-Gelting Linien, etc, until sale to Jadranska Linijska Plovidba (Jadrolinija), in 1981 as the Balkanija. the name was changed to Istra in 1992. 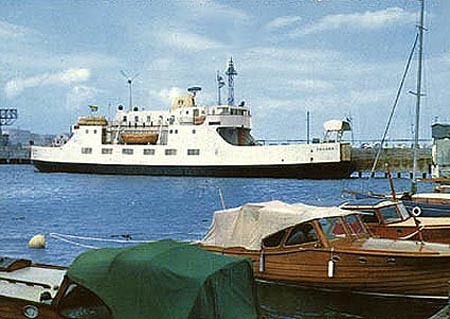 Vanga (2) was built by Ankerløkken Værft Glommen A/S, Fredrikstad, as the Bastø III for A/S Alpha, Moss, for their Moss-Horten route. 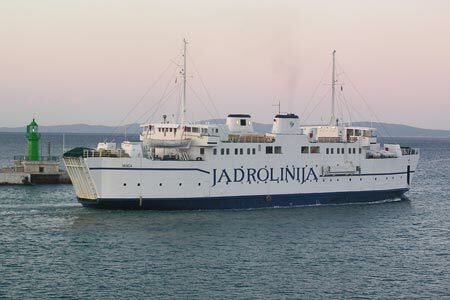 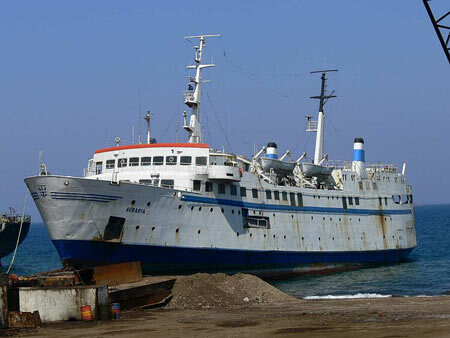 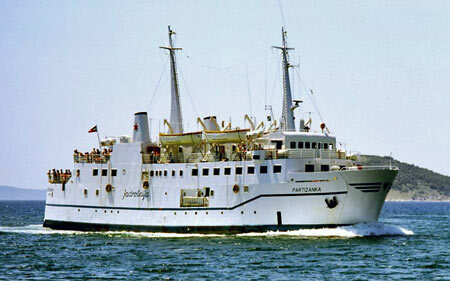 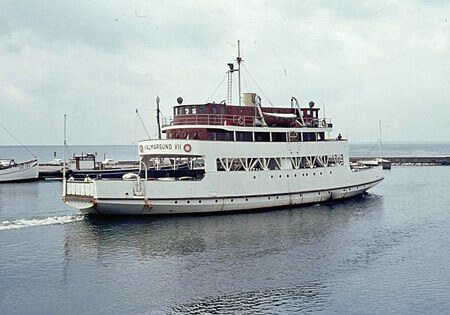 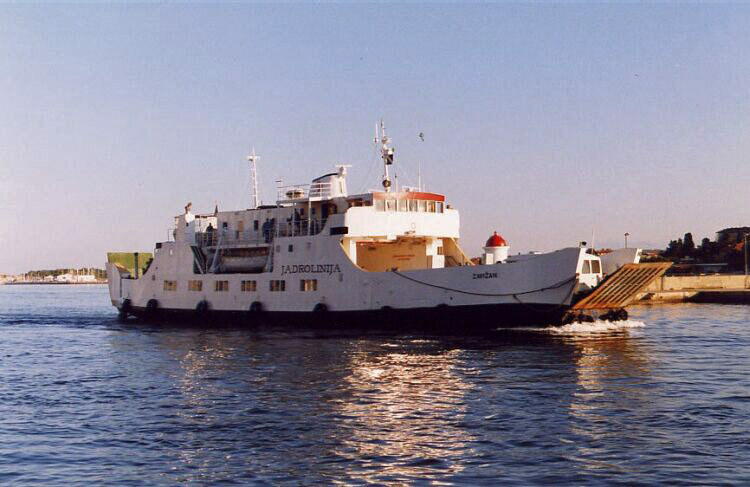 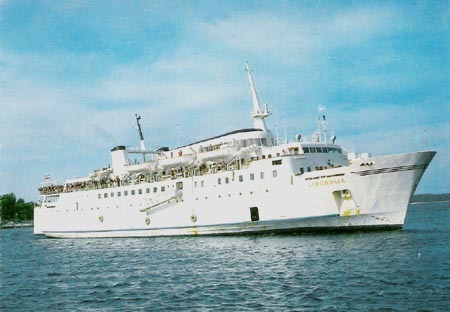 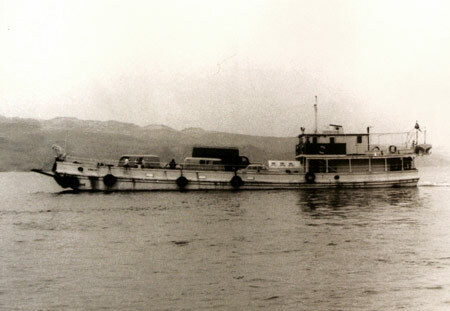 She was sold to Jadrolinija in 1985 and renamed Vanga. 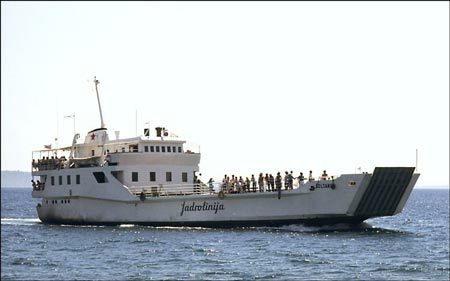 Vladimir Nazor (2) was built by Brodogradiliste "Titovo", Kraljevica, for Jadrolinija in 1986. She has operated on routes from Split and Zadar. 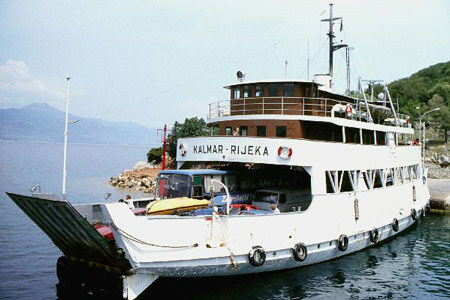 Mate Balota was built in 1988 at Titovo Brodogradiliste, Kraljevica. 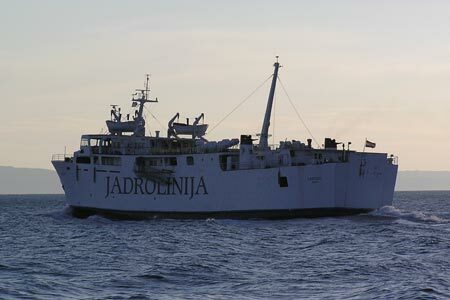 In 2004 she moved to the Zadar-Preko route. 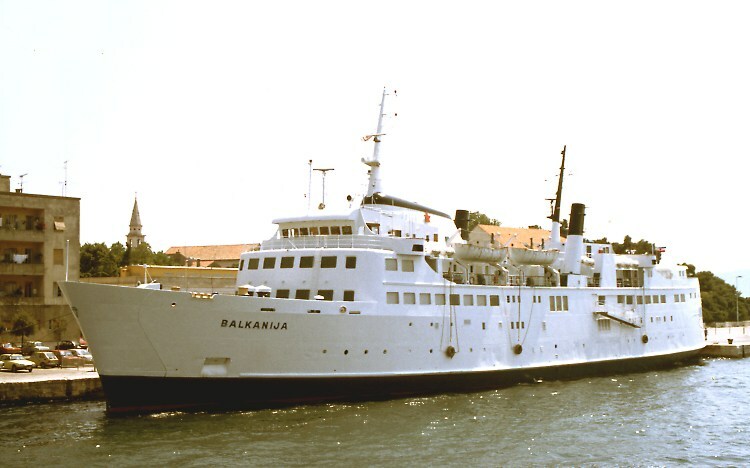 Marko Polo was built as Peter Wessel (3) in 1973 by Ateliers & Chantiers du Havre, for A/S Larvik-Frederikshavn Ferjen. 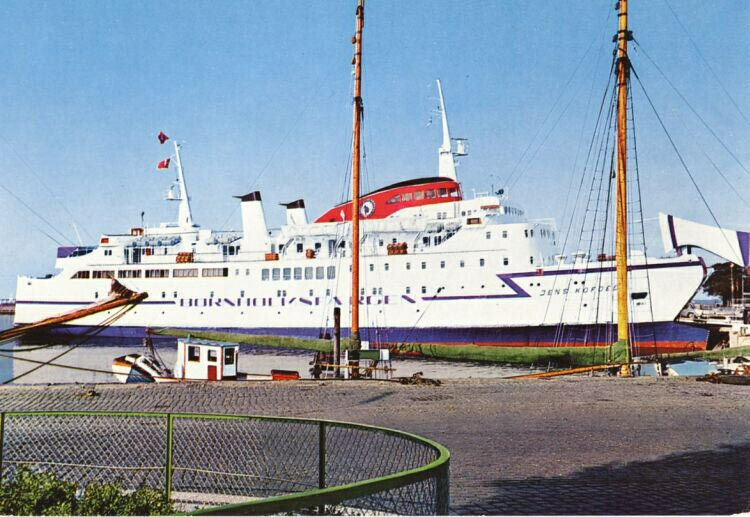 In 1984 Peter Wessel (3) was replaced by Peter Wessel (4), and chartered to Stoomvaart Maatschappij Zeeland N.V (SMZ) for Harwich-Hook of Holland service as the Zeeland. In 1985 Peter Wessel (3) was sold to Stena Line and renamed Stena Nordica. 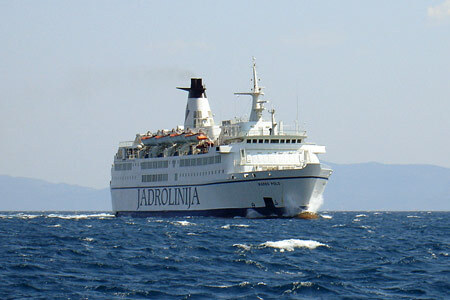 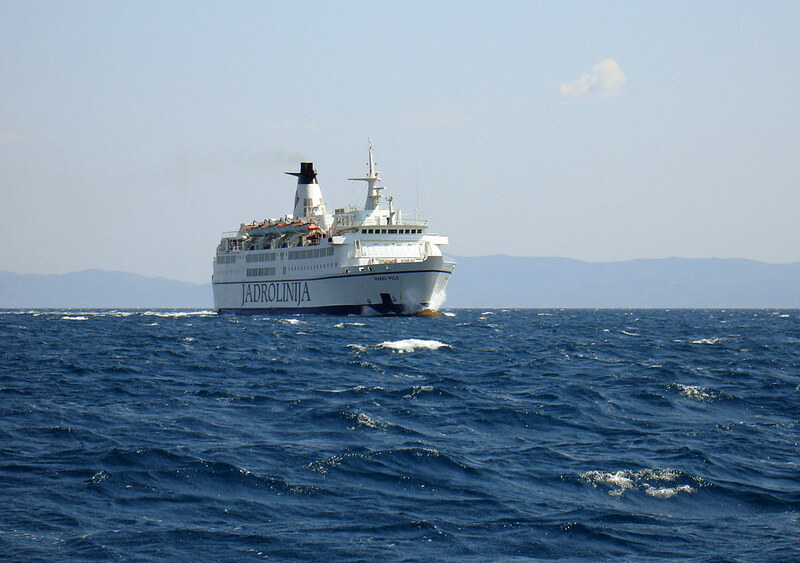 In 1988 Stena Nordica was sold to Jadrolinija and renamed Marko Polo, entering service between Ancona-Corfu-Patras-Corfu-Dubrovnik-Split-Venice. 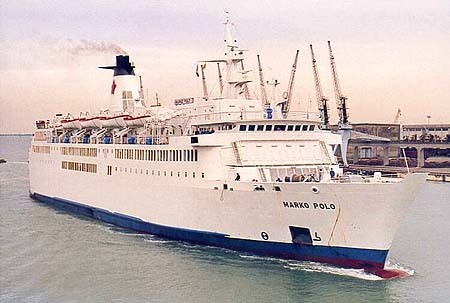 In 1992 Marko Polo was chartered to TT-Line for Trelleborg-Rostock service. 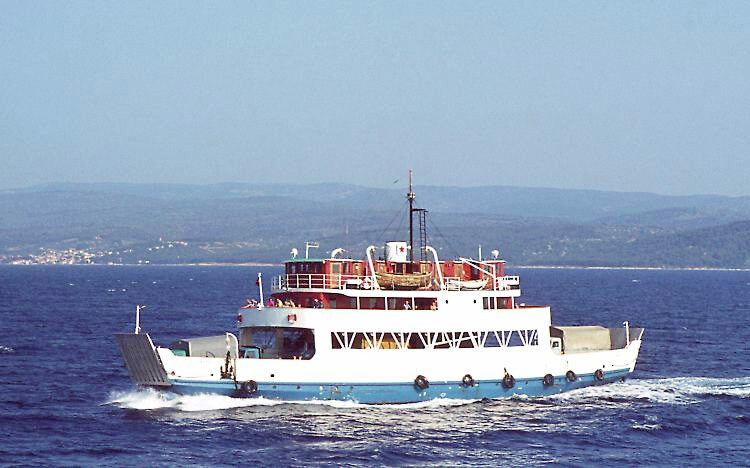 In 1994 Marko Polo was chartered to Compagnie Marocaine de Navigation (COMANAV), for service between Nador-Sete. 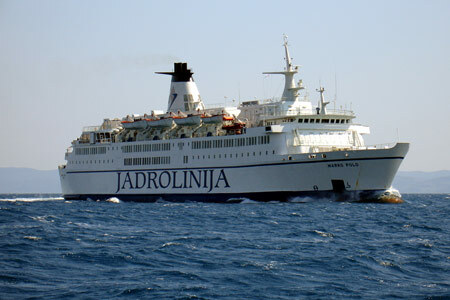 Marko Polo remains in Jadrolinija ownership in 2007. 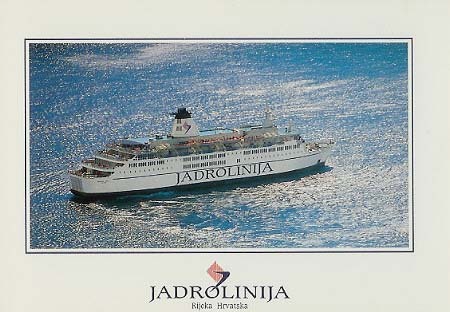 Official Jadrolinija postcard of Marko Polo. 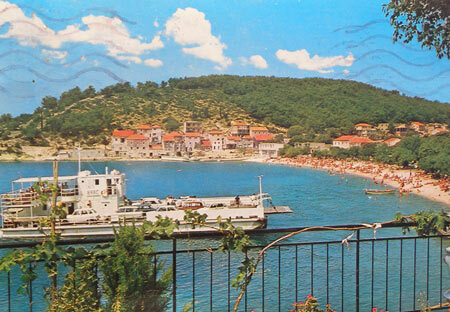 Simplon Postcards release of Marko Polo. 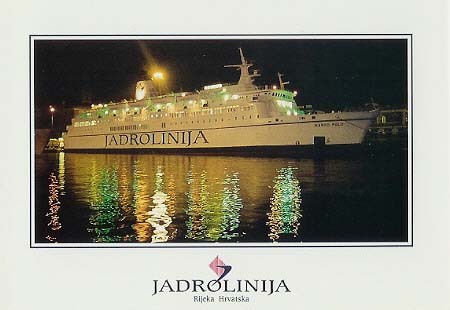 Jurjevo was built by Brodogradiliste "Titovo", Kraljevica, in 1980 for Republicki Sekret za Pravos. She passed to Jadrolinija in 1989, and was renamed Sv.Juraj in 1991. 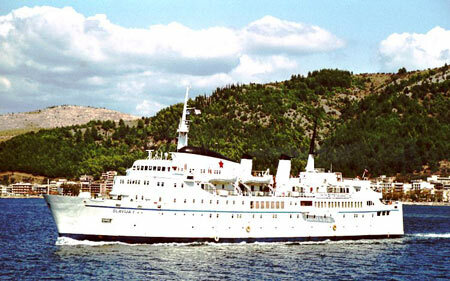 She had been substantially rebuilt in 1990. Vuk Karadzic was built by Titivo Brodogradiliste, Kraljevica, for Jadrolinija in 1989. 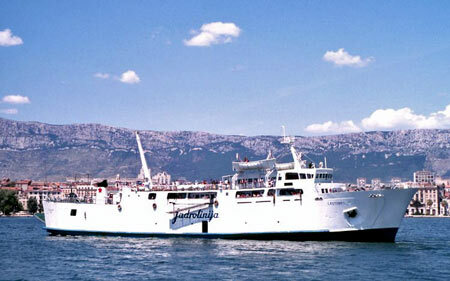 She was renamed Bartol Kasic in 1991 (previous name being Serb). 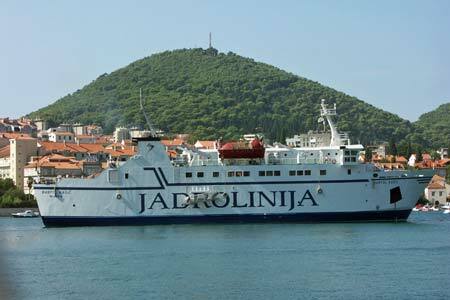 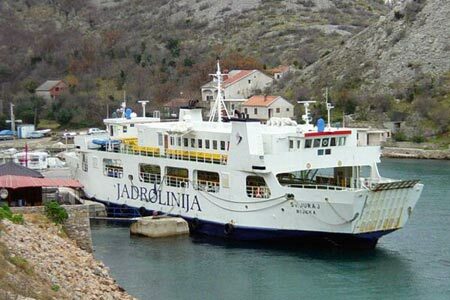 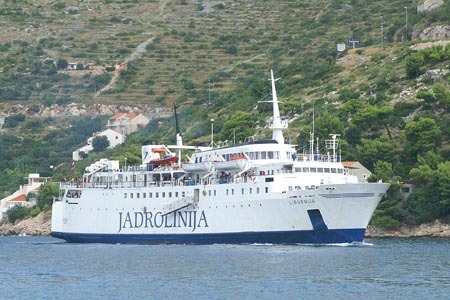 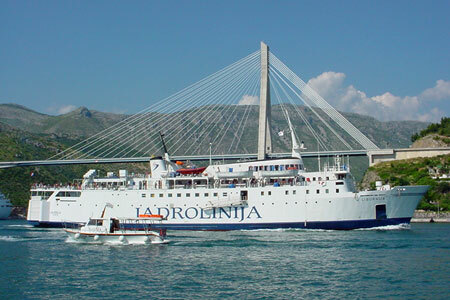 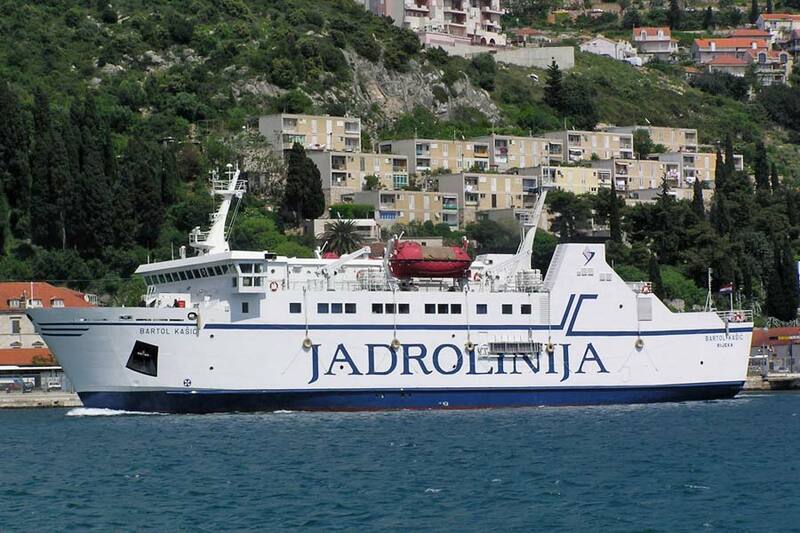 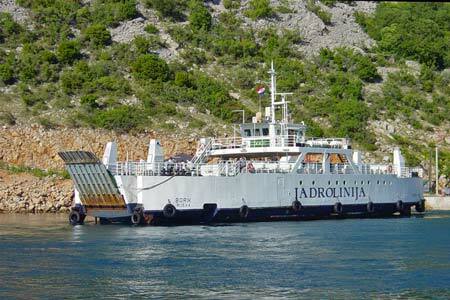 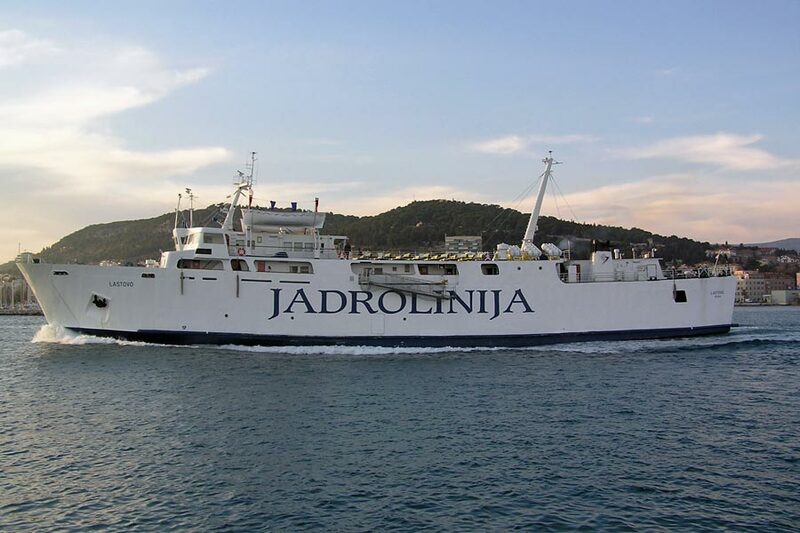 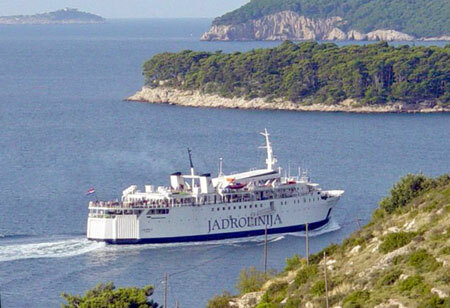 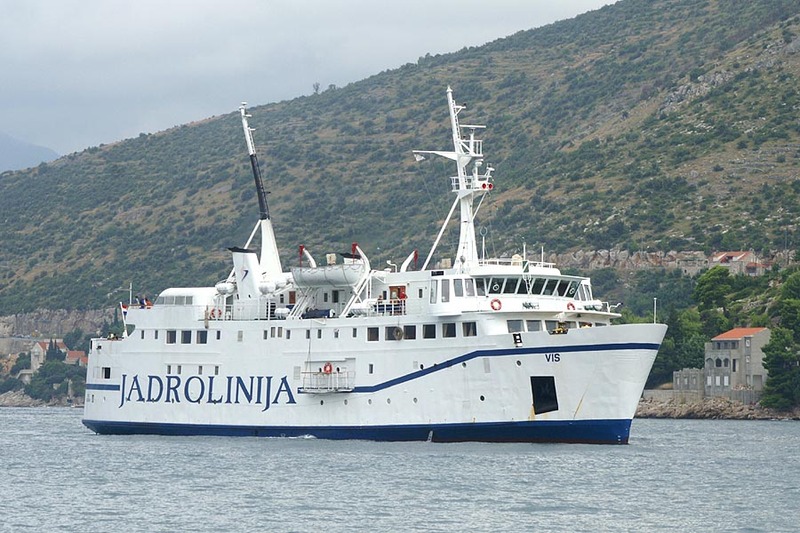 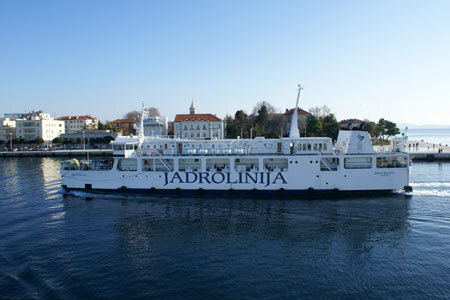 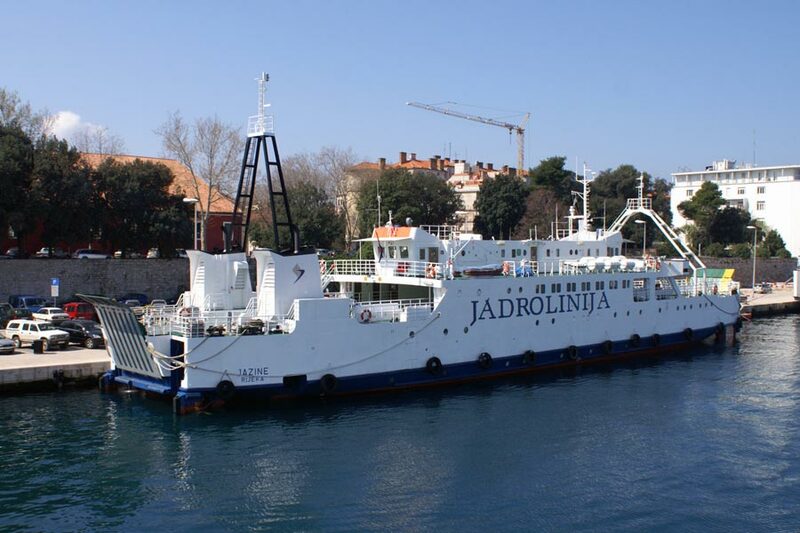 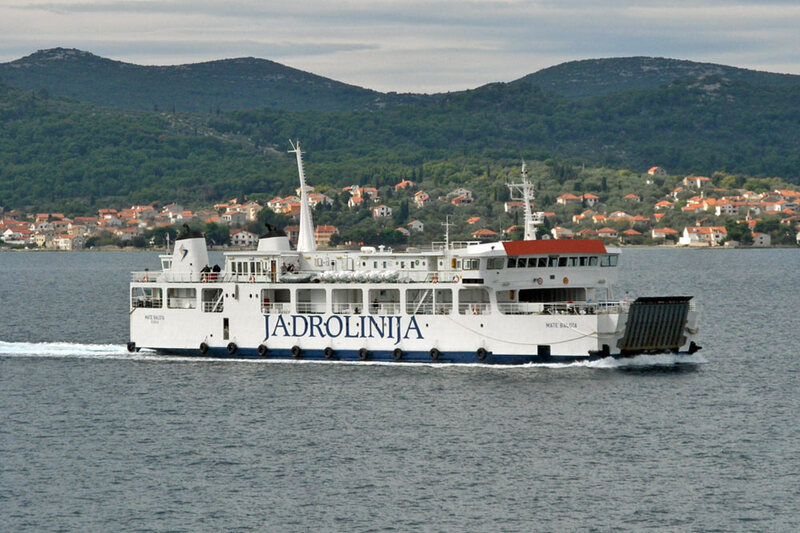 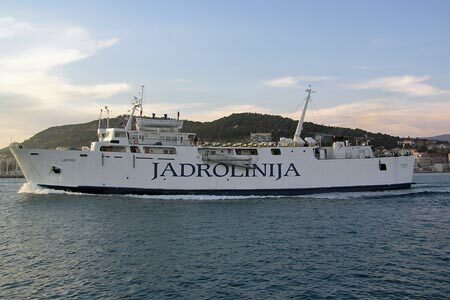 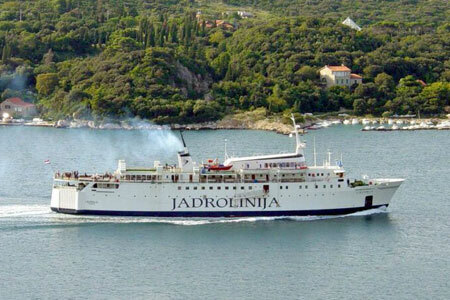 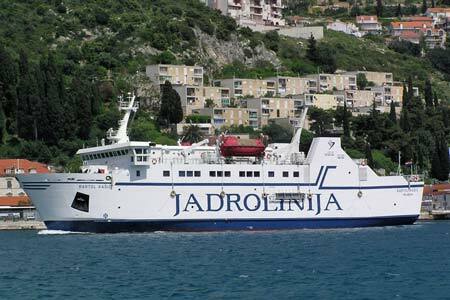 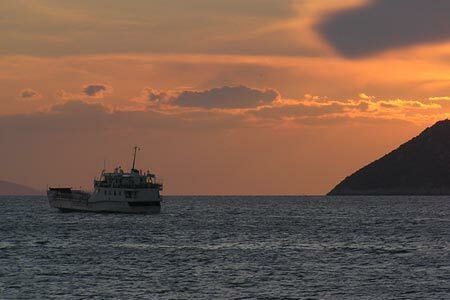 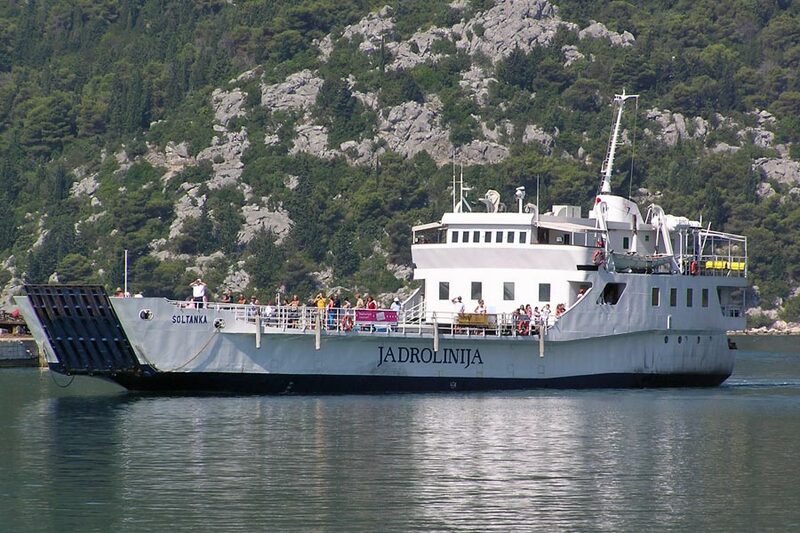 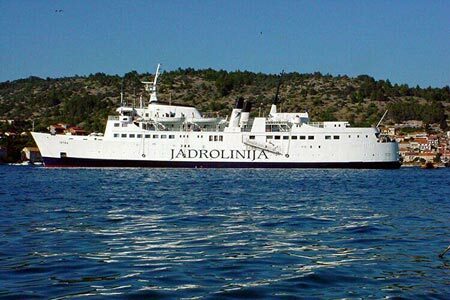 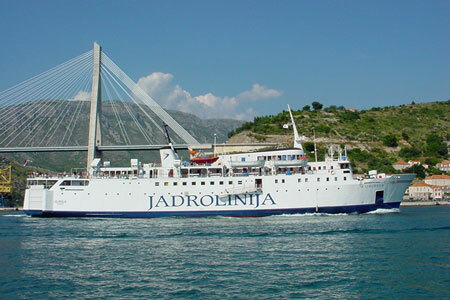 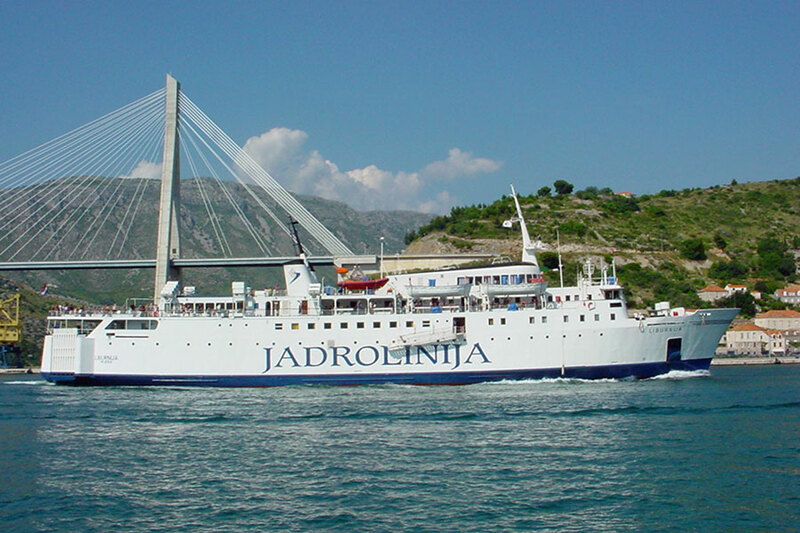 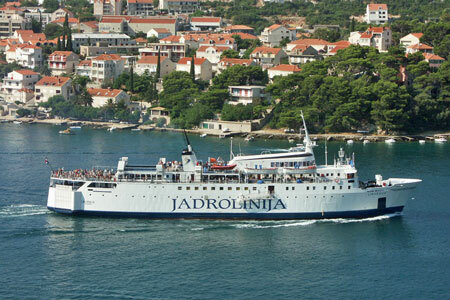 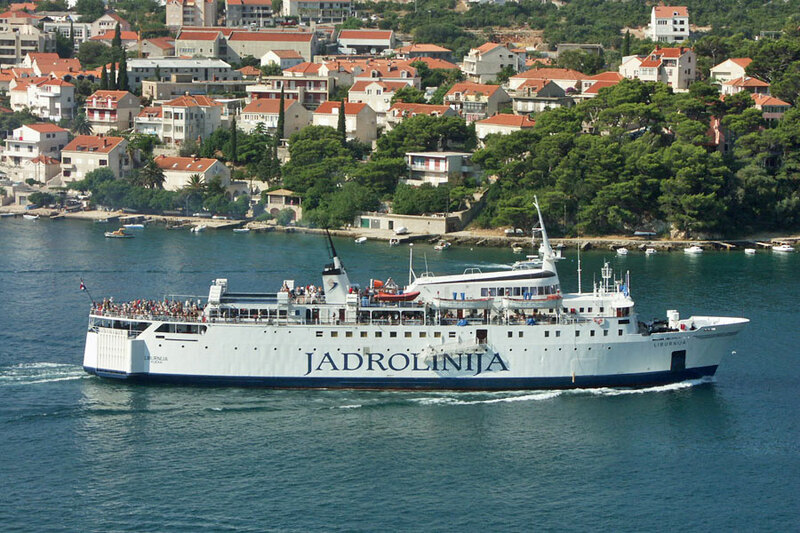 She entered service between Dubrovnik and Mljet, but has subsequently run on vaious routes from Split and Dubrovnik. 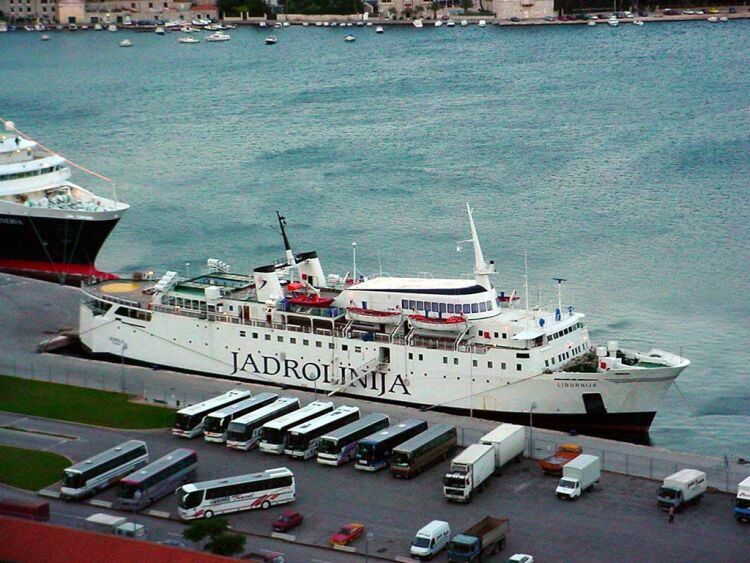 In August 2006 collide with a quay in Split and 18 passengers were injured.